I visited the Gaudi’s Sagrada Familia in Barcelona recently for the first time, and happened to look upon the Josep M Subirachs’ Passion Edificio, and was especially struck by the sculpture of Christ hanging by the wrists. The difference is that this Christ was hanging only by his hands from a cross horizontally suspended from the front of the church, instead of being vertically planted into the ground. Subirach’s atypical sculpture emphasised one element of the grotesque brutality of crucifixion – the downward pressure of gravity on hands – out of a few other choices, the flayed skin from the condemned’s back, the nails being driven through the hands to create the stigmata (usually the emphasis). This highly personal idiosyncracy, is what I consider the touchstone of modernism in the arts. To me, Modernism is an individualist ethos, not a style. I much prefer this highly stylised sort of sculpture over the strict requirements of Renaissance photorealism began to be relaxed for the painters, with the perfection of perspectival rules, most of which leaves me cold. It seems to me that much of the painter’s energy was engaged in portraiture as ur-photography for the nobility, so that art from those centuries tend to be either functional portraits that were intended as ur-photos, or second-rate allegorical scenes. Modernism could thus be equivalent to the maxim of “letting a thousand flowers bloom”. And in the splintering, we find very few schools with many people working within a strictly defined aesthetic, as the photorealistic Renaissance school. The radical cubist portraiture of Picasso (Ambrose Vollard, man with guitar) may be allied with the cubist landscapes of Braque, but one generally finds not that many major cubist styles that Picasso had not done (he was legendarily prolific with 50,000+ paintings; and in the 30s, he painted luminously round portraits of his mistress, and in his 50s he created a much more fluid subject-cubism with surrealist backdrops, I recall a picture of a convoluted sea monster on a beach, which name temporarily escapes me). Why is Gaudi’s interpretation of Christ hanging from the “ceiling” by the wrists successful? What makes it successful (and surprising) is a long history of Christ crucifixion depictions, such that the viewer always has that reference point of a vertical cross. 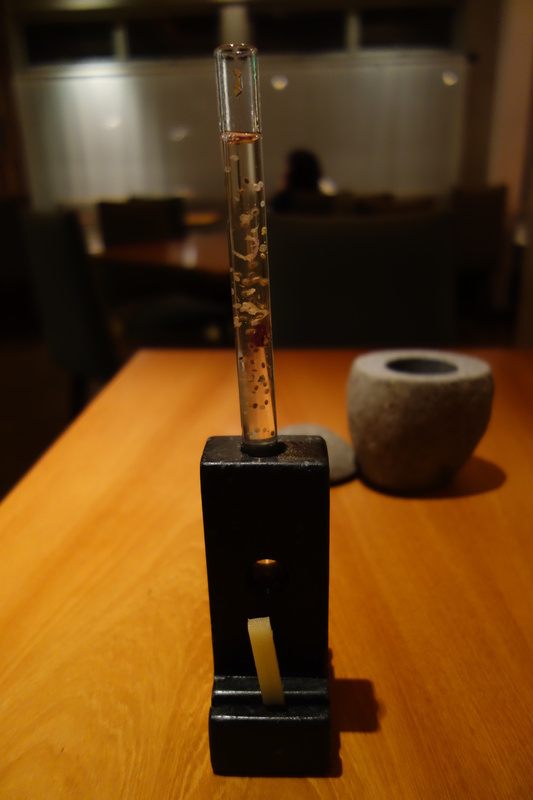 And that reference point is a pillar of strength in modernist interpretations, because it gives another data point to dazzle the diner (see, the Atera cracked-egg dessert, or the Alinea balloon). 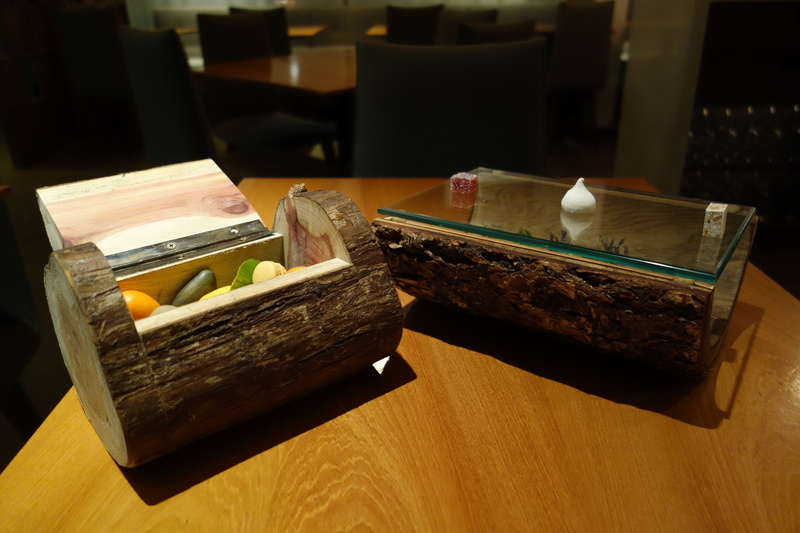 And so too is modernism in food, if the increasing amount of personalisation outside of the French-haute cuisine style can be analogised with the increasingly personalised styles at the dawn of modernism in the early 20th century. 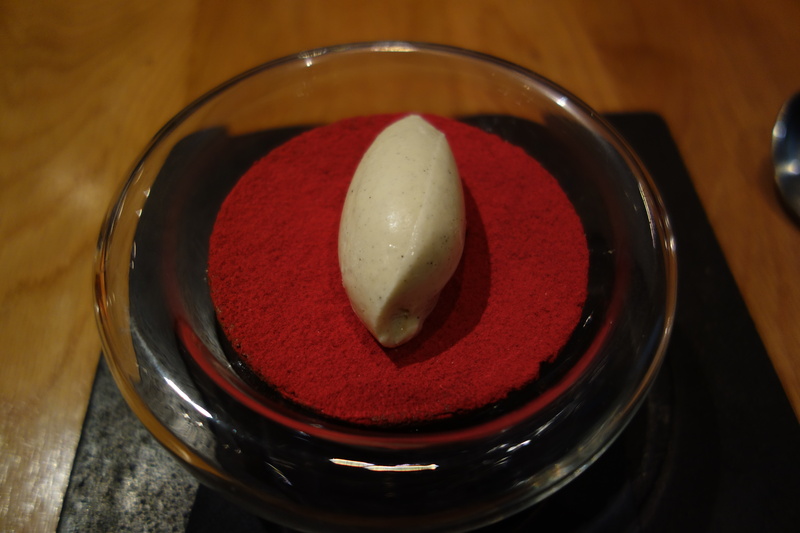 When Ferran Adria calls his style of food “techno-emotional”, it is not the direct style of food that other chefs imitate (who explicitly calls his/her food “techno-emotional”?) but the ethos of changing the menu every year to something completely different, committed to providing the diner with new dishes and new sensations no matter what the cost. 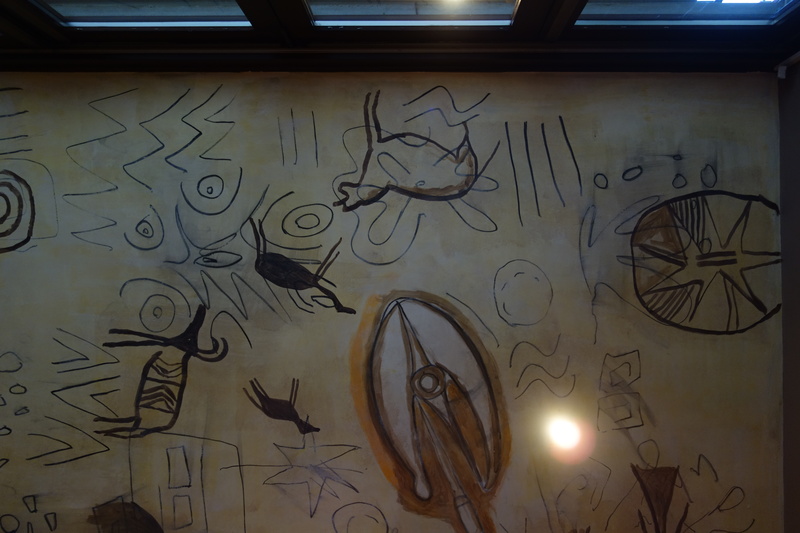 In this sense el Bulli seems similar to the practice of the unclassifiable Picasso (who was more than a cubist, producing some first-rate Blue-period pictures). This seems the real legacy of modernism in food, an ethic of constant and personal exploration. 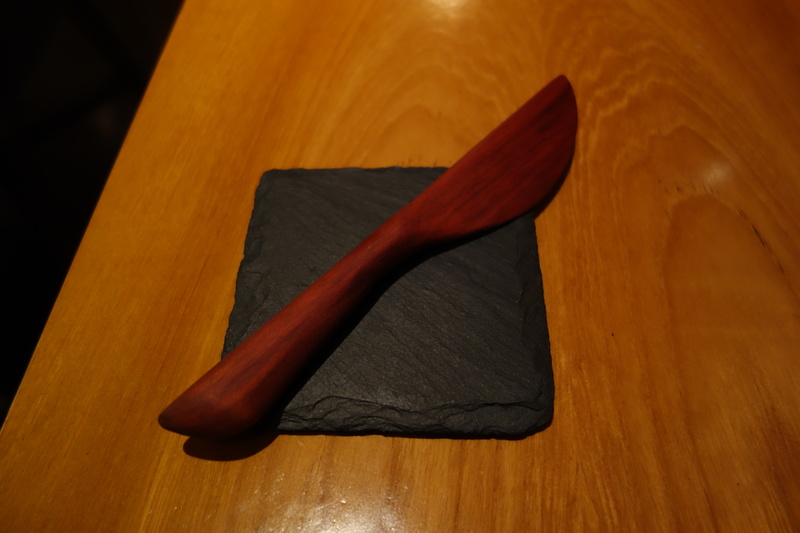 On top of the substratum of the chef’s ethic (of ceaseless exploration of new flavor possibilities, of organic, of loca-vore, which is the internalised ethic of almost all of the top chefs in the US) is style. 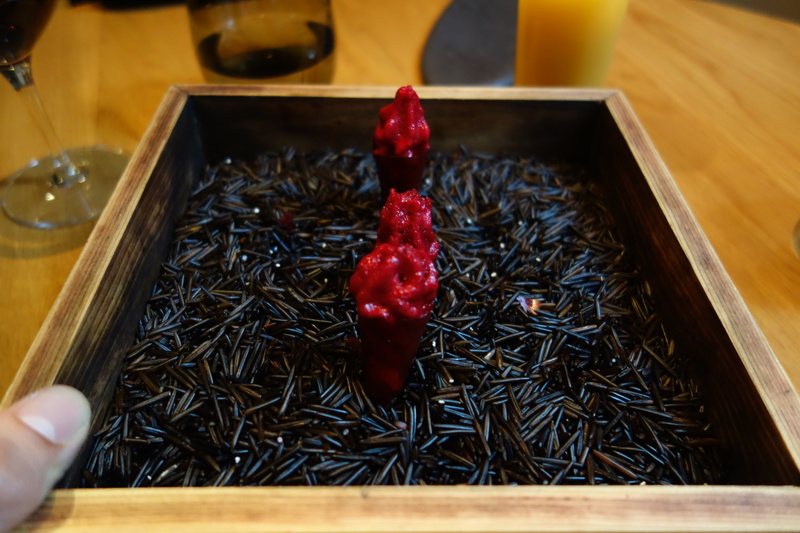 Here Chef Dominique Crenn, to extend the analogy of early modernist art, seems to be a cross between a surrealist and a abstract painter. This is not a merely visual analogy, this style extends to the flavor combinations she produces as well. 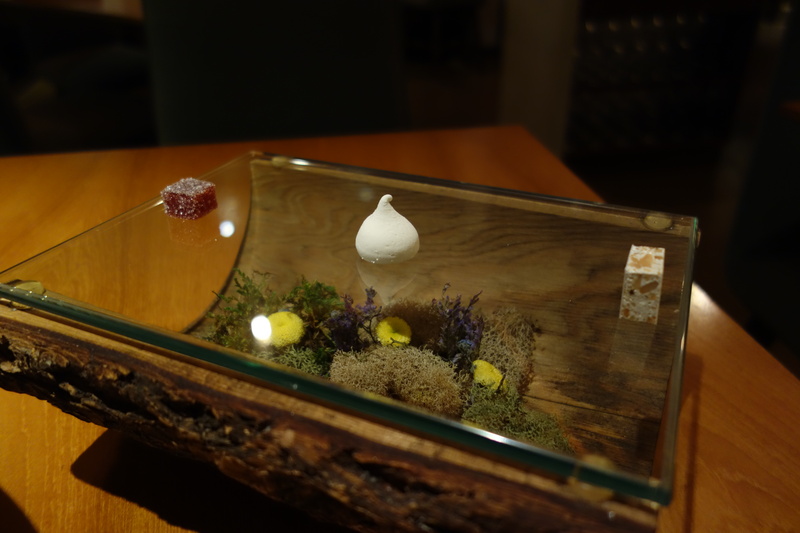 Atelier Crenn may well be the most imaginative restaurant I had the chance to visit in the US this year (more than Alinea, or Atera; who else could think of an all-encompassing dessert from the life of bees, or create a vegetable pin-cushion using a vinegar meringue, or a Dali-esque composition involving Birth? 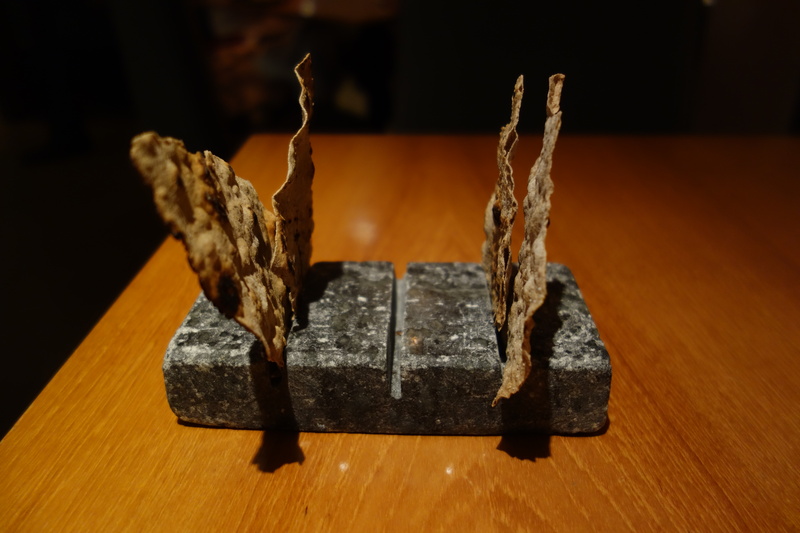 ), but there is something missing about the harmony of the tastes sometimes. 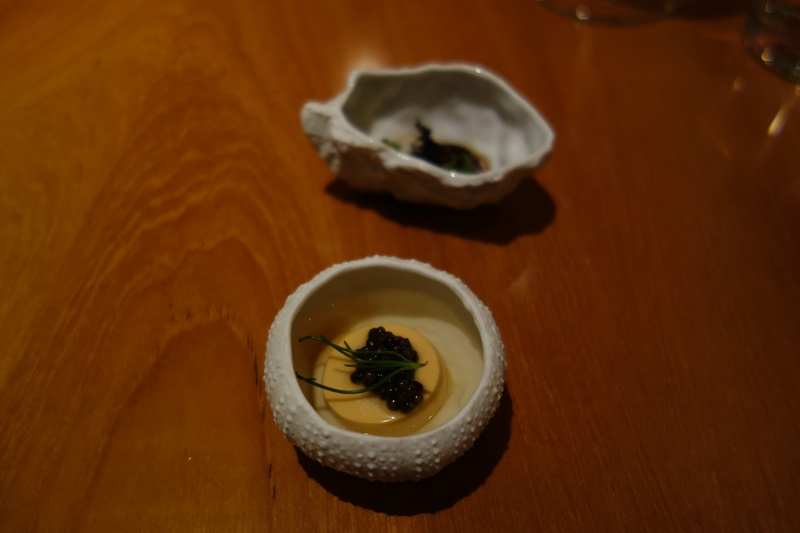 Atelier Crenn is still a work in progress, and of the 5 fine-dining meals I had in the Bay Area in April, it was perhaps the weakest. 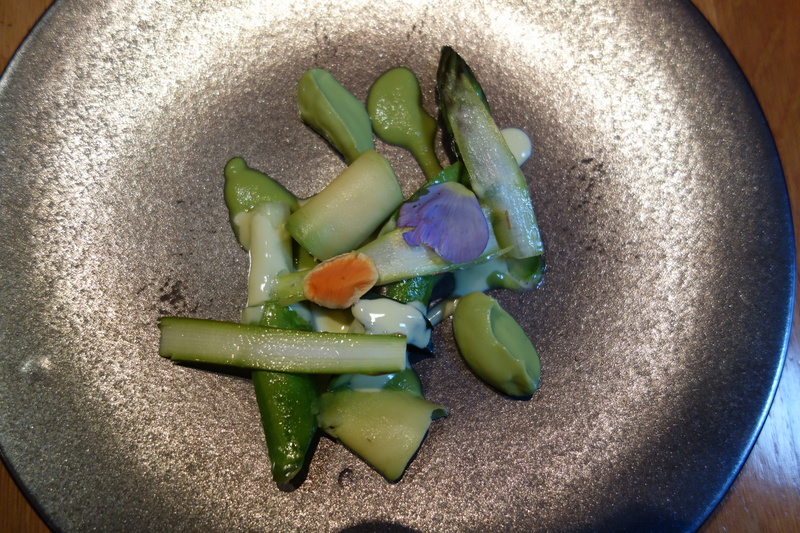 But it is also one of two meals (with Manresa) that satisfied the intellectual and artistic senses the most. 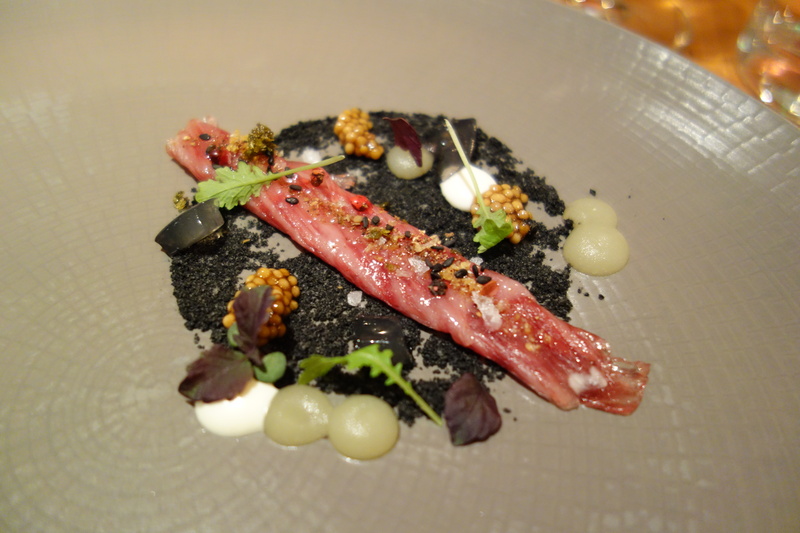 There is no doubt that Chef Crenn is a true artist, my hope for my next visit is that the pleasures of tongue will match the pleasure she conjures for the eyes. 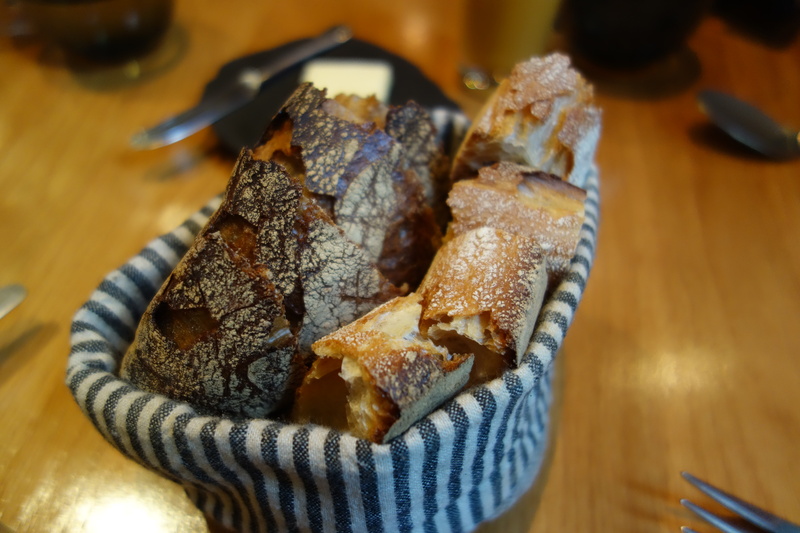 In my first fine-dining visit to California (Atelier Crenn, Saison, Benu, Manresa, Meadowood), I found that the old stereotype about Californian cooking, where ingredient-simplicity rules (under the influence of Alice Waters from Chez Panisse), is simply not valid. 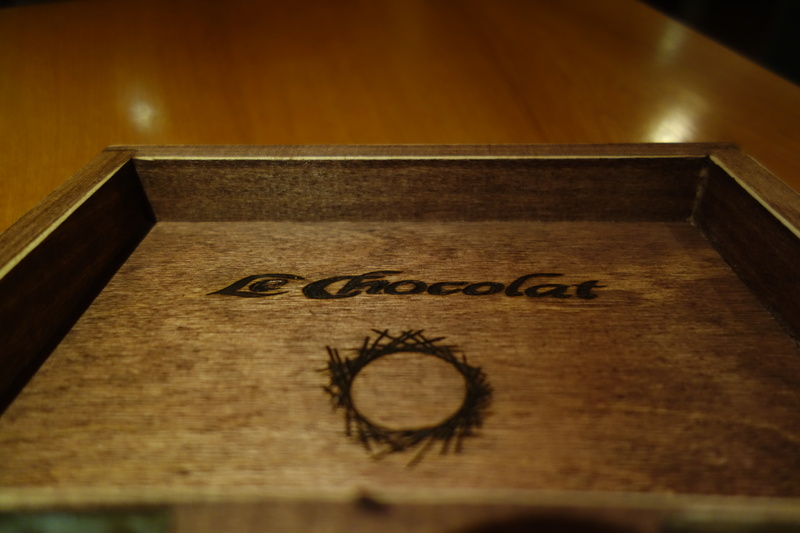 Chefs there are taking great risks with modifying the ingredients. If Atelier Crenn is abstract surrealism, then one can analogise Californian-naturalism a la Waters, with Renaissance realism in art history. Modernism’s personal expression makes it prone to going out of fashion, as adhesion to an artist’s personal aesthetics can easily change, but it generates greater loyalty than a widely-accepted dogma as Californian naturalism, or Renaissance realism. That is the evangelist-mass-adopter distinction found in Silicon Valley business thinking. But like Renaissance realism is a second-rate artistic school for me, pure naturalism when it comes to ingredients, seeking to transform them as minimally as possible, seems a second-rate cooking philosophy. 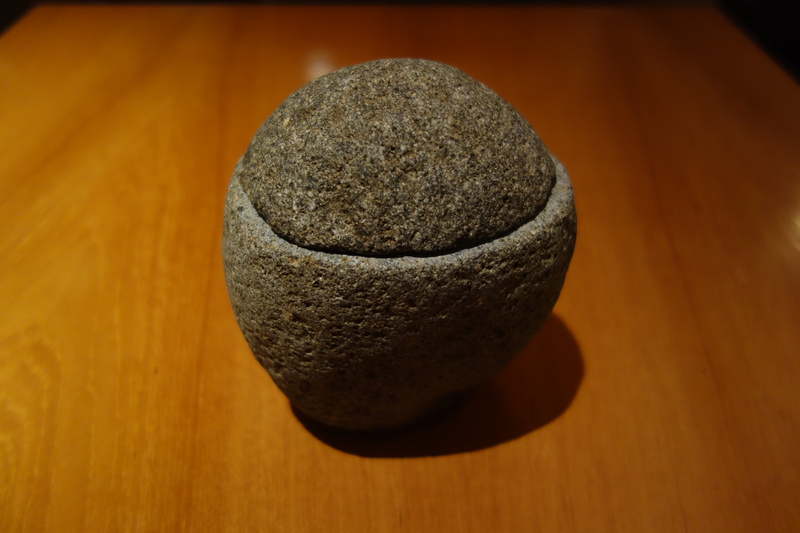 Pure naturalism cannot produce truly great dishes. 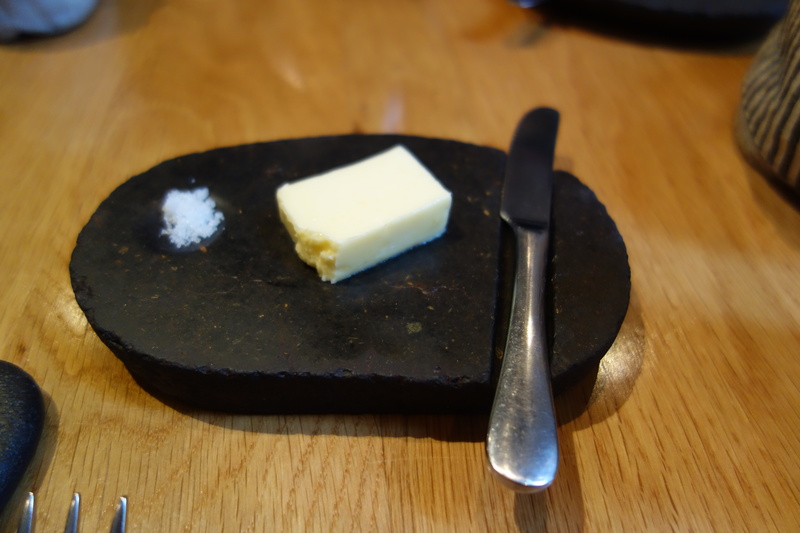 While I have never found a formula for the great dishes I have liked, I don’t remember ever thinking a very simply cooked dish was truly great – there are usually just too many jagged edges in the ingredient pairings, that must be smoothed down by the chef to ensure a harmonious interlocking taste profile. 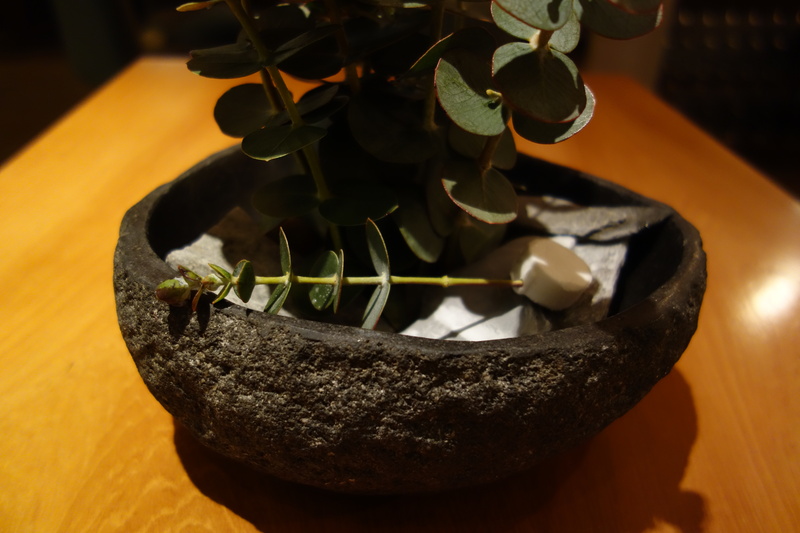 It is necessary for a chef to have the leeway to transform the ingredients. 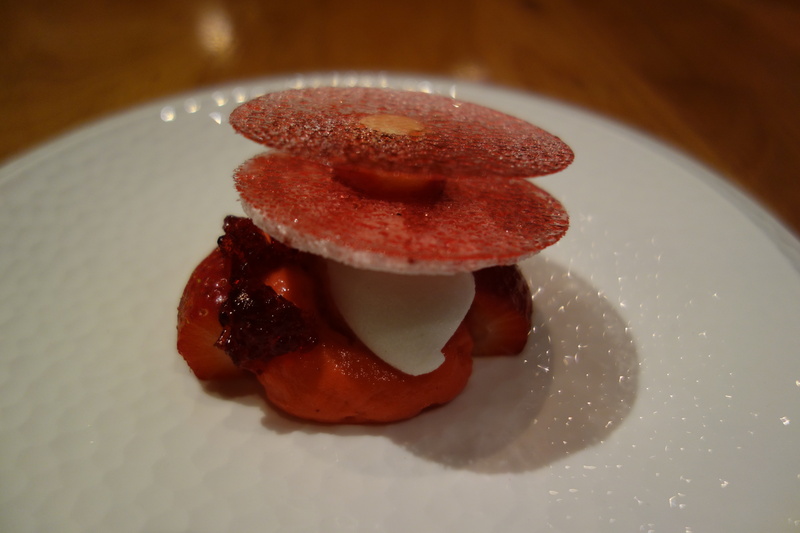 Mikael Jonsson of Hedone is a man who has surely has opinions on Californian cuisine. 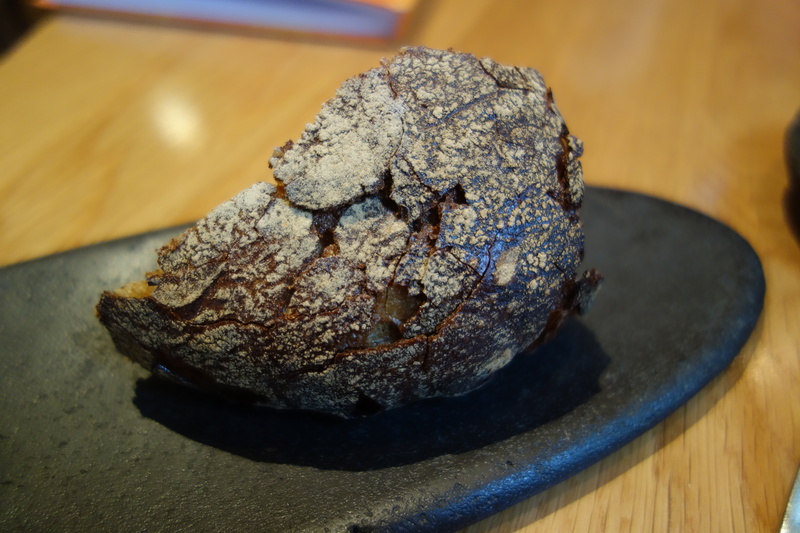 Formerly co-writing the influential Gastroville blog with Vedar Milor (now writing as Gastromondiale), he opened Hedone in London in 2011, and seems to have taken down the restaurant reviews he formerly wrote on Gastroville. 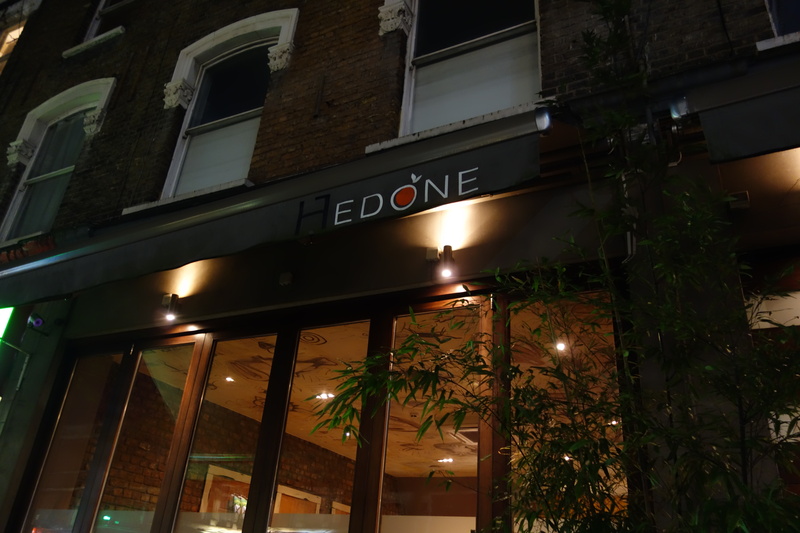 Hedone is a restaurant that specialises in ingredients sourcing. 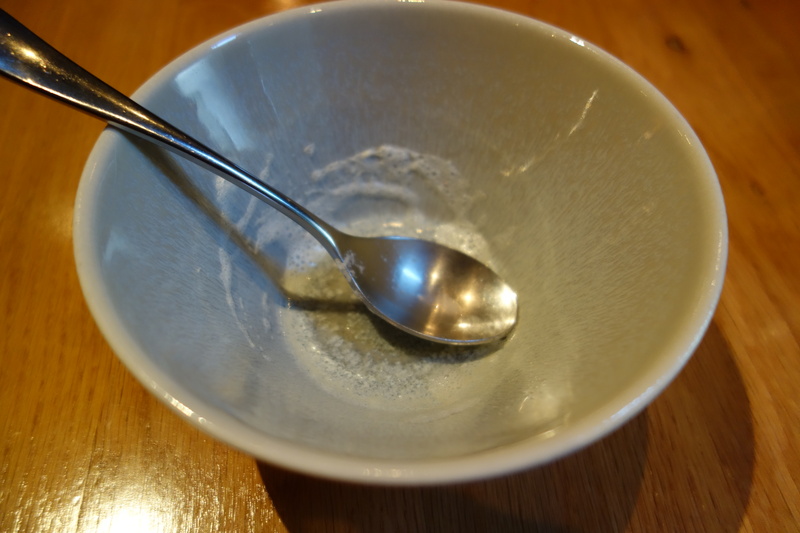 Indeed, ingredients seem to have been the focus of the Gastroville and Gastromondiale blogs. 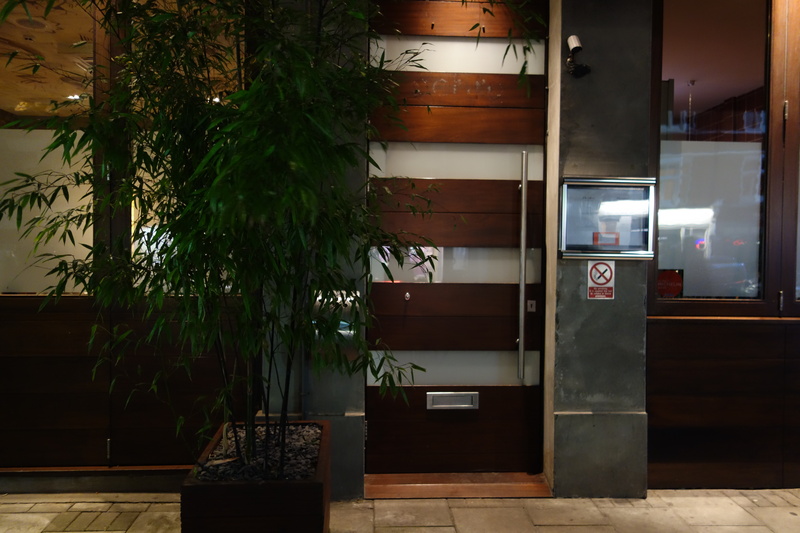 The restaurant is pegged by Mr Andy Hayler (a hugely influential critic and blogger who has been to every 3* restaurant in the world), as serving food between the 2*-3* level. 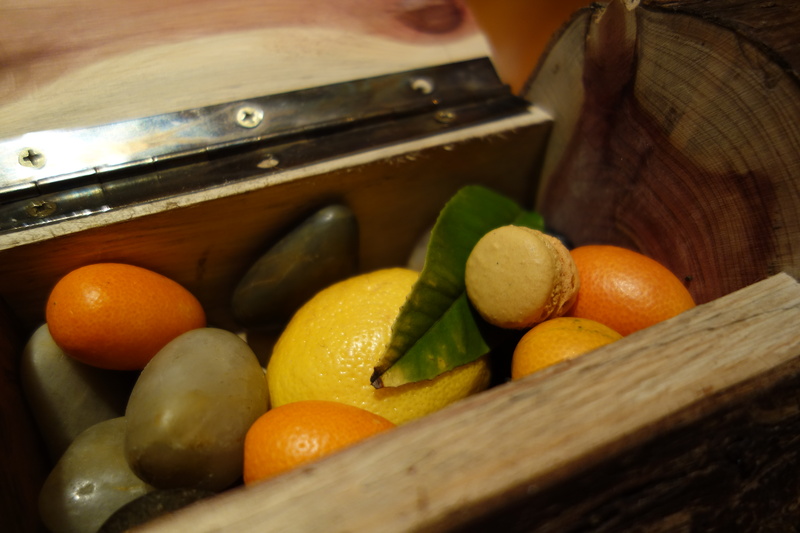 When I visited in late May, the impeccably sourced ingredients, were half-the-time minimally transformed. This created an association in my mind between Hedone and my trip to California. 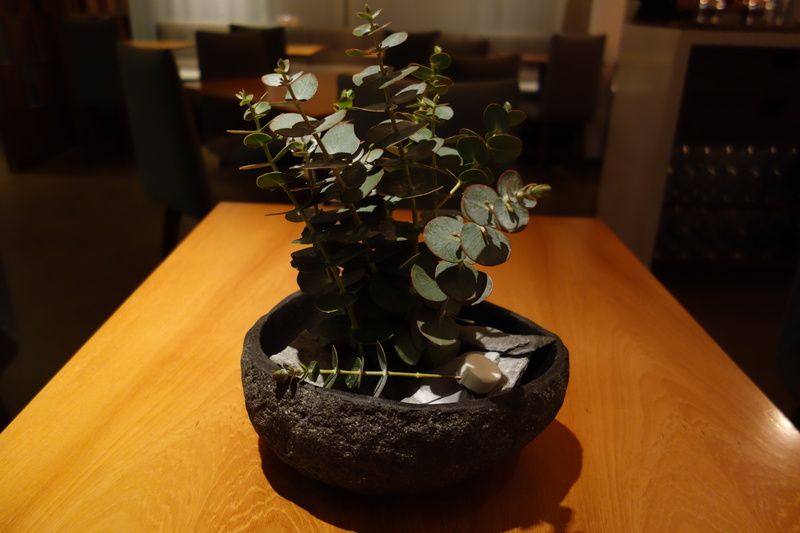 Here, in London, of all places, I had found a restaurant that seemed in tune with the stereotypical Californian naturalist philosophy, minimally transforming ingredients a la Waters. 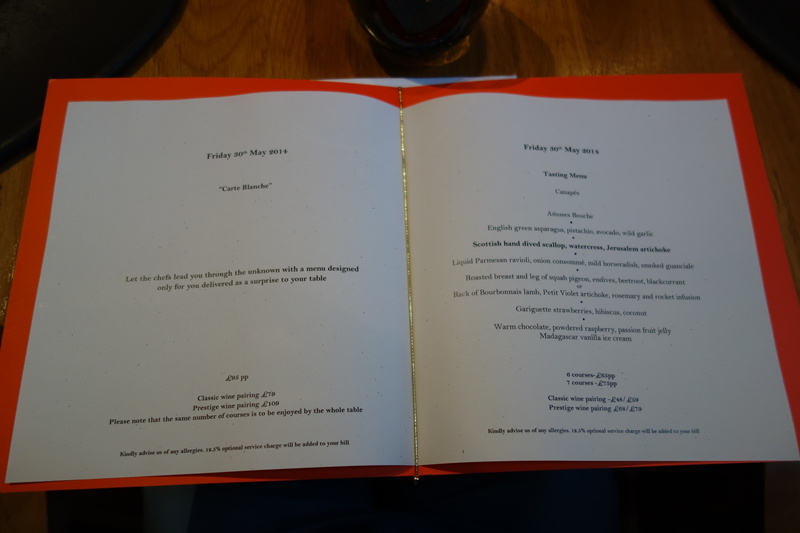 That half of the Hedone menu (Dorset seabass, Scottish hand-dived scallop, asparagus, pork, lamb) reminded me heavily of that ingredients-first philosophy. 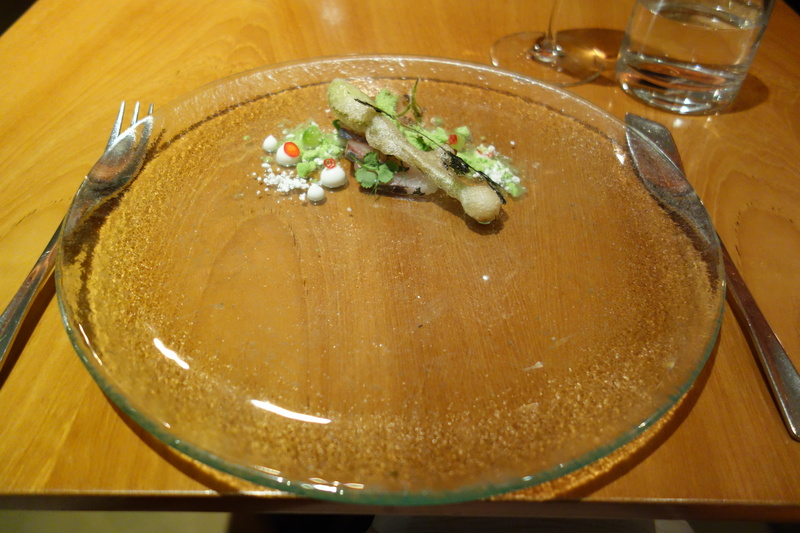 While I enjoyed that half of the menu, I also found there to be limits on how nice a pure-ingredient dish could be. 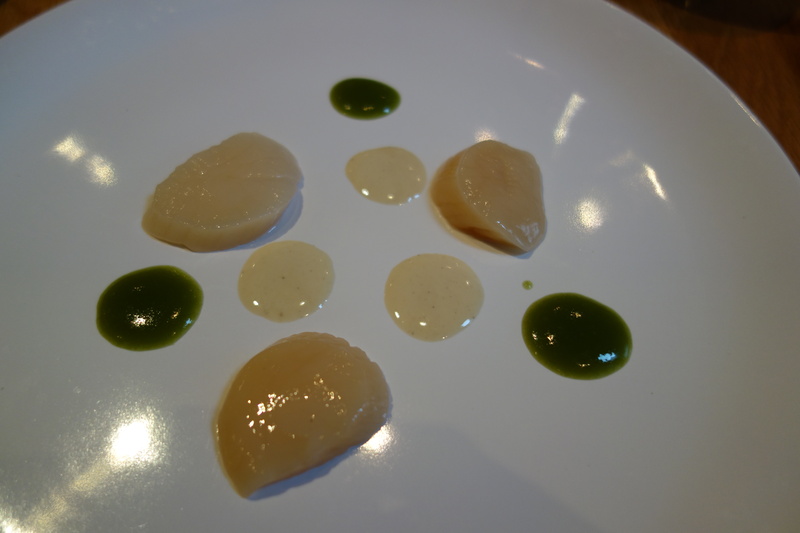 Perhaps the best of those was the Scottish hand-dived scallop, which had a crunchiness that was really superb. 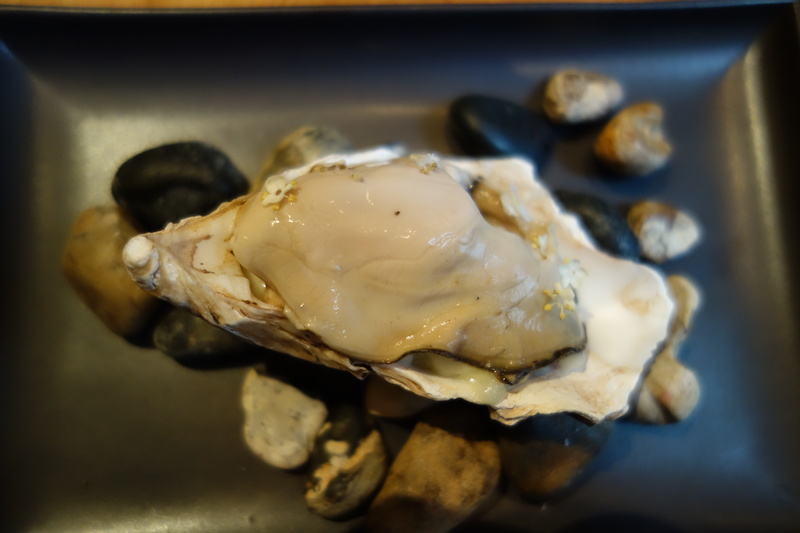 So it was all the more disappointing when the oyster, and lamb (the last main) were comparatively devoid of taste. 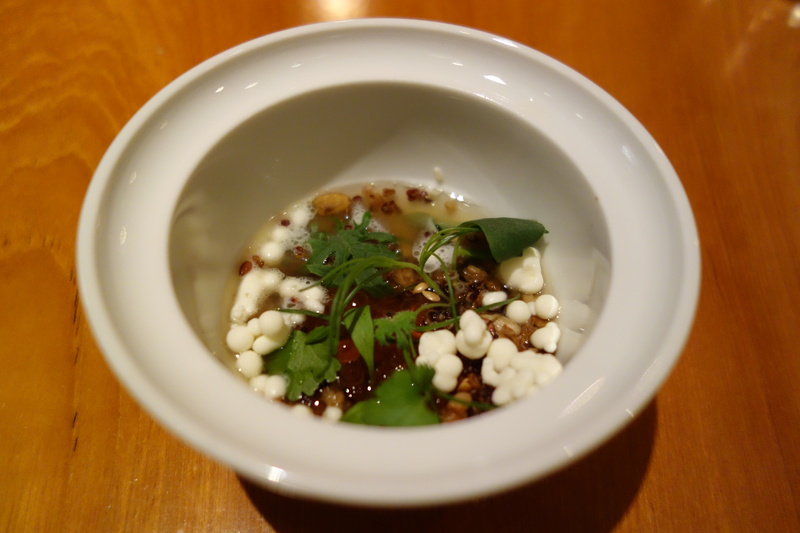 When Hedone’s ingredient dishes work, they are very good though not great dishes. 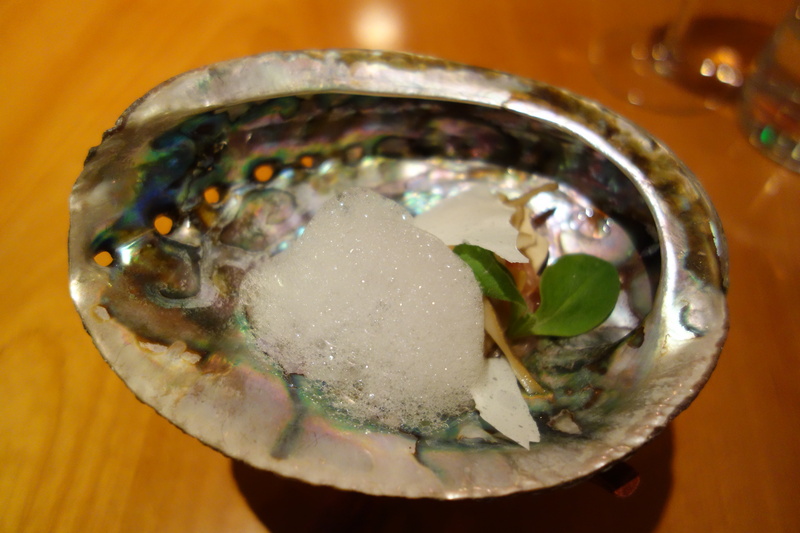 I remember the texture of the scallops, but not as well the mint, lime, cucumber flavors that came with it. 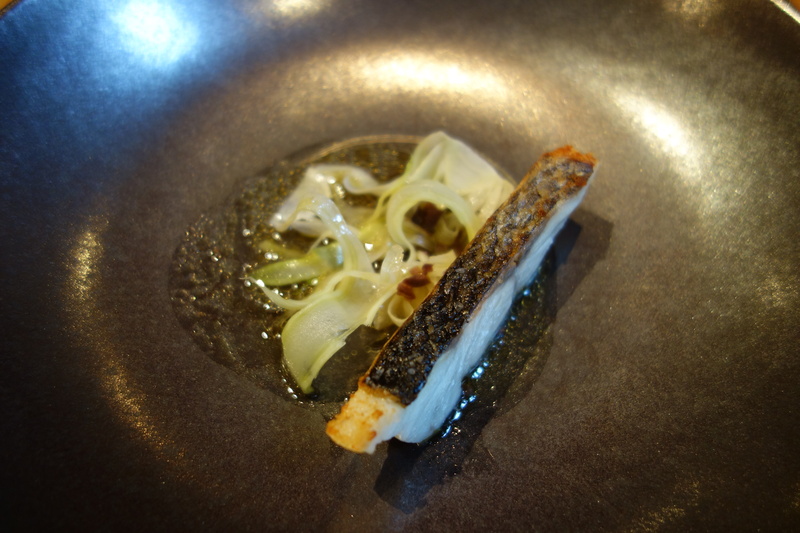 So too the sea bass, where the bass was good but the accompaniments more forgettable. 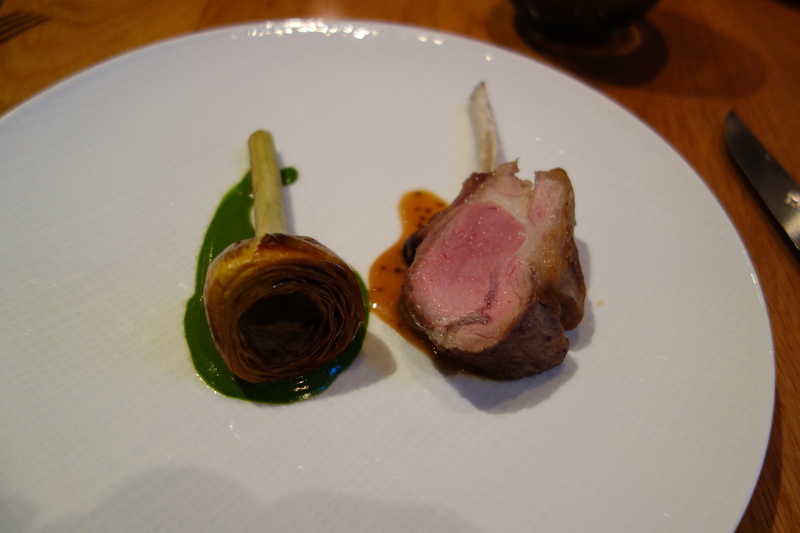 But sometimes the cult of the ingredient-dish can puzzle with its intimations of the Eleusinian mysteries – the bland lamb (very good, I’m sure) and nice pork (pleasant) not really showcasing any added delta in performance from superior ingredients. 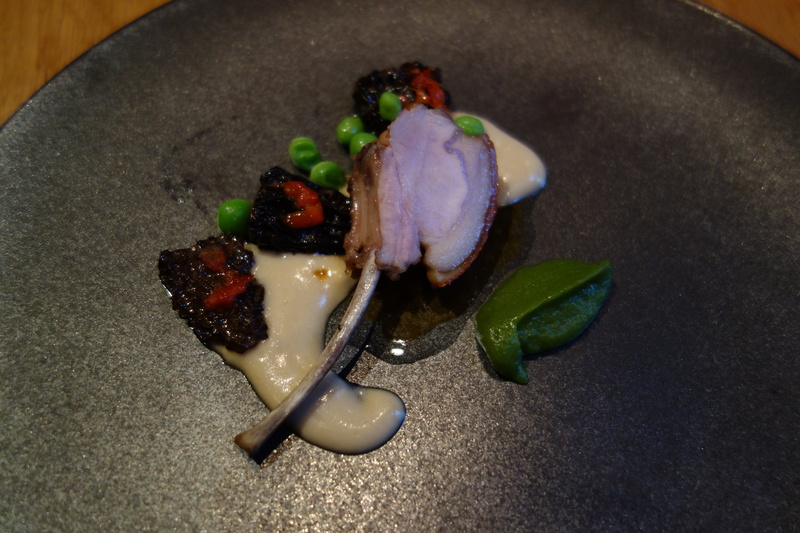 One commonality of both my Atelier Crenn and Hedone meals was that the last mains (guinea fowl, AC; lamb, Hedone) were disappointing, which lowers the score of both restaurants. 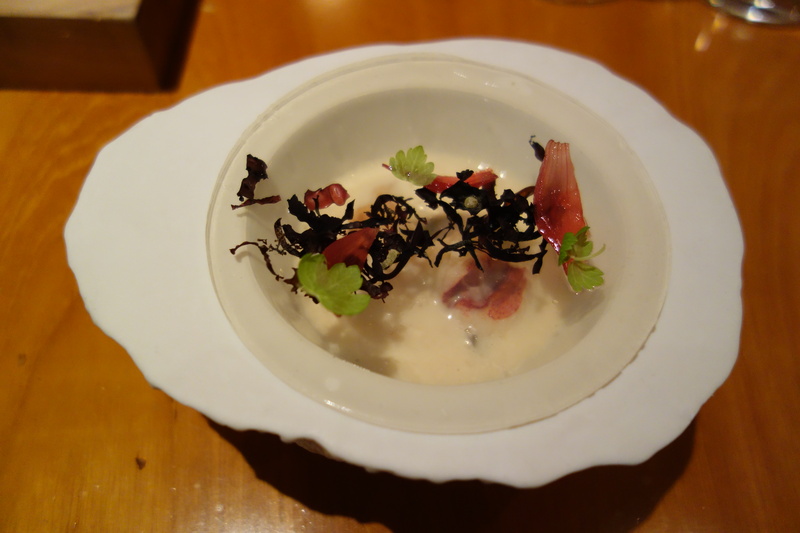 The last main is the crescendo, which all courses build up to. More care must be paid by both restaurants to the last main. 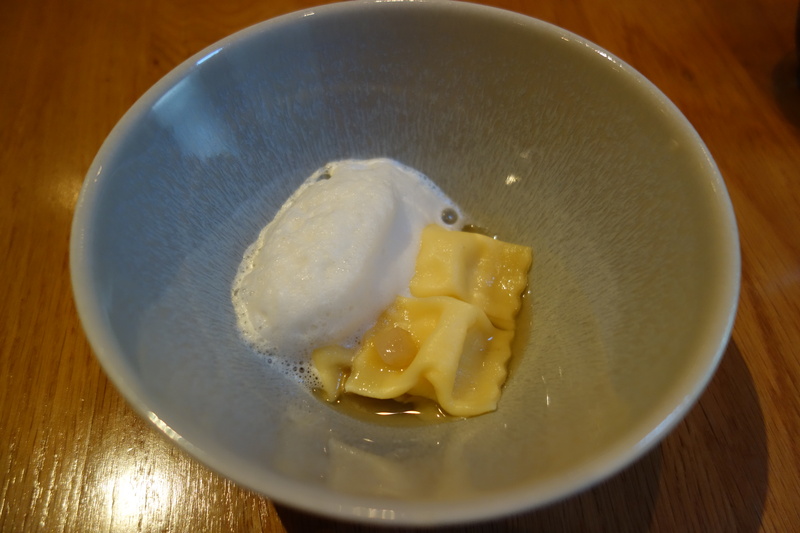 The more modernist touches on display at Hedone were pleasant but paid less attention to the texture of the dish than I would like (I liked the taste of a cuttlefish confit, but had to basically saw my way through a thin slice of cuttlefish; a Parmesan ravioli was a bit rough). 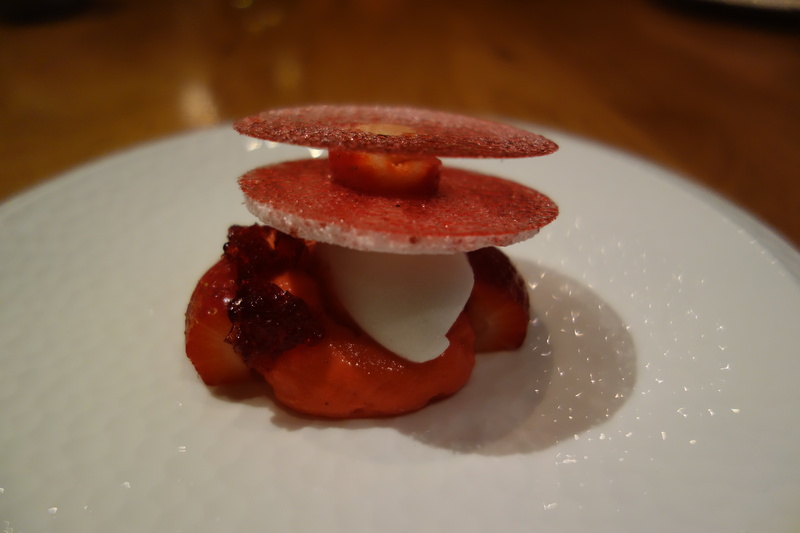 Where Hedone really shines are the desserts – a chocolate fondant and Gariguette strawberries are truly memorable creations. 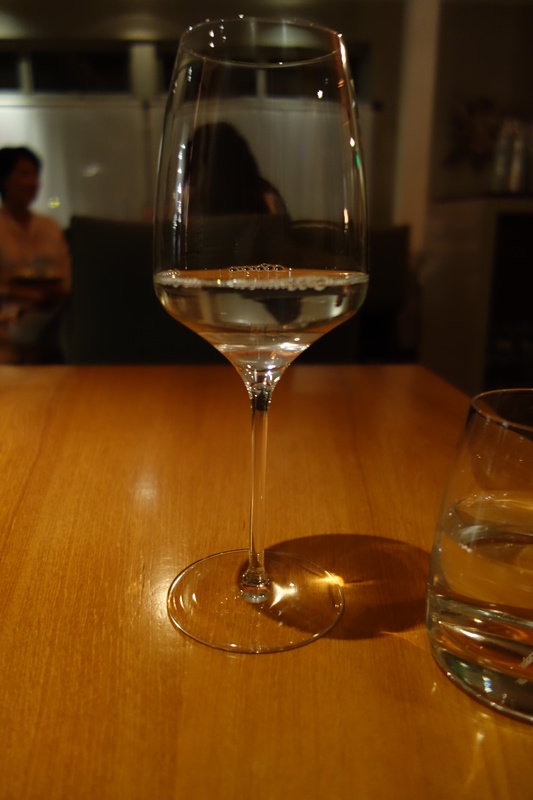 Hedone reminds me of Saison, though much less polished. What I think separates the two is that there a consistent cooking philosophy across the plate at Saison: transformation by fire. I did not as much perceive the individual style of Mikael Jonsson in his cooking, beyond the testimony of his ingredients themselves. I do genuinely wonder if Hedone will develop a signature style as Mr Jonsson matures as a chef, given his own ideological commitments to clarity of ingredient tastes set out in his Gastroville blog. Which provokes the amusing thought-experiment. 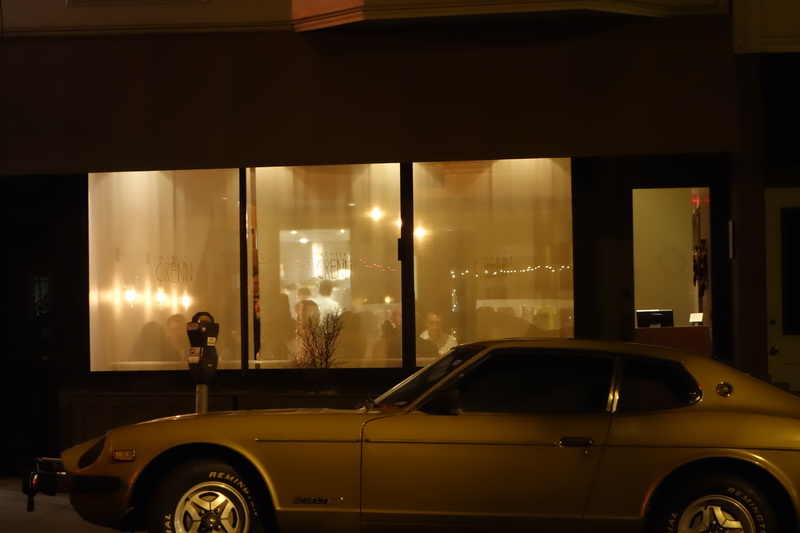 What if the two restaurants switched places? 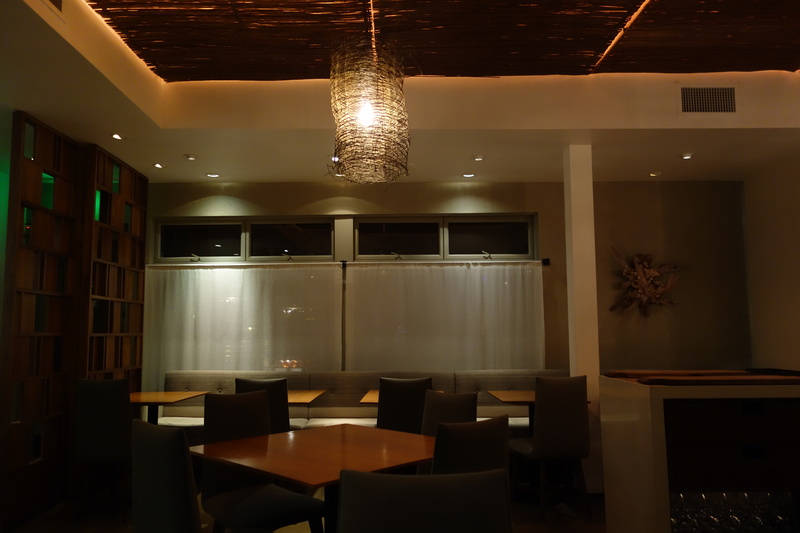 It almost seems as if Hedone and Mikael Jonsson are spiritual successors to the ingredient-first philosophies of Alice Waters and Chez Panisse. 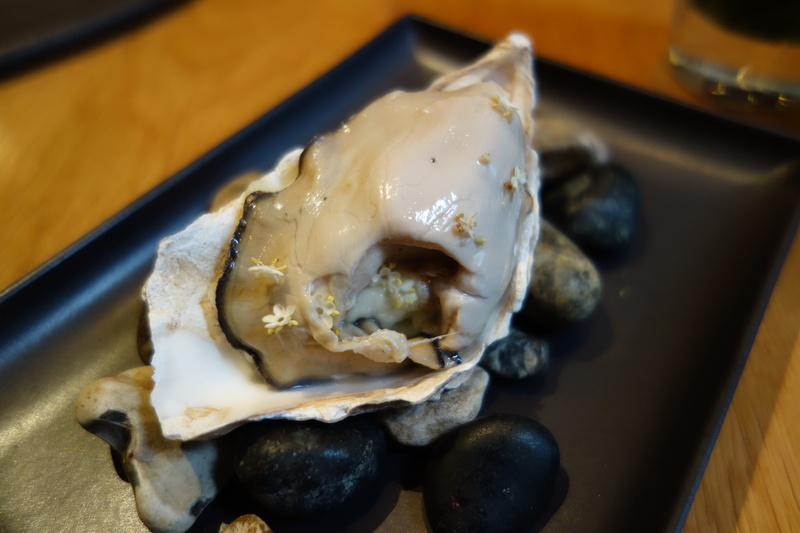 That we should eat the very best local ingredients in fine-dining, is now a global ethos that has transcended France and Alice Waters’ California. And Atelier Crenn being particularly modernist-process-driven, is a restaurant that could really exist anywhere in the world today. *Note: Menu and dish descriptions are a poem written by Dominique Crenn herself. EDIT: Here is a video of most of the dishes, being prepared by the kitchen. 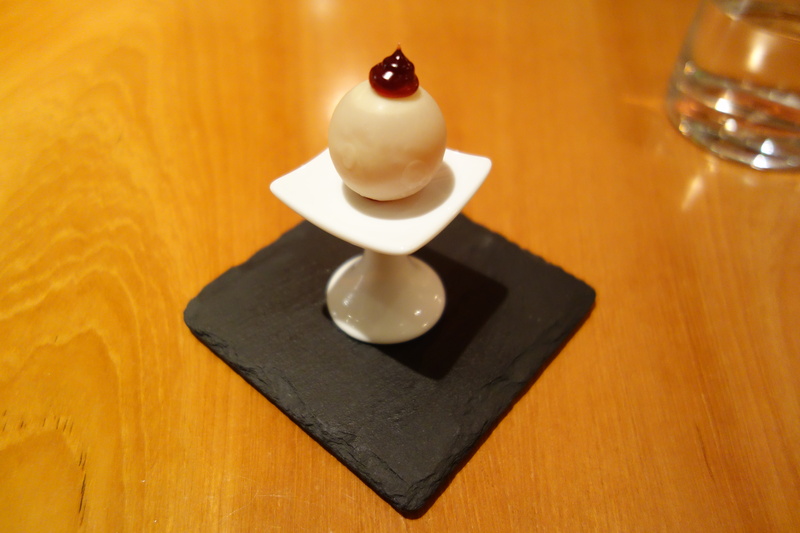 Cider suspension with the creme de cassis jelly, within a cocoa butter shell. Fruity, dominating liqueur. Very enjoyable. 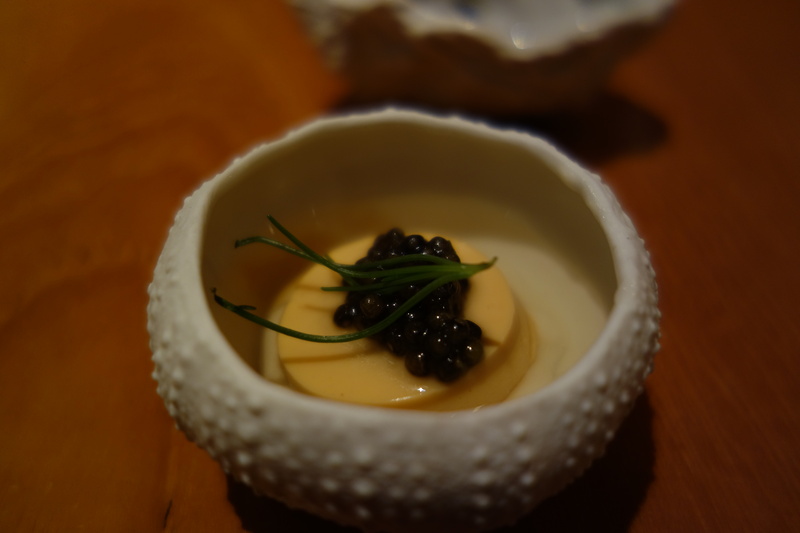 Uni custard, with caviar from Sacramento Delta. 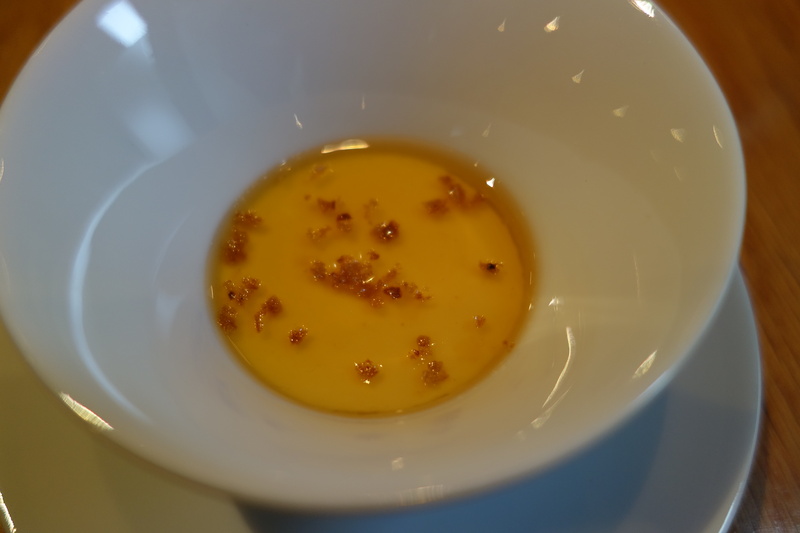 Smoked potato gelee, licorice consomme. Interesting. 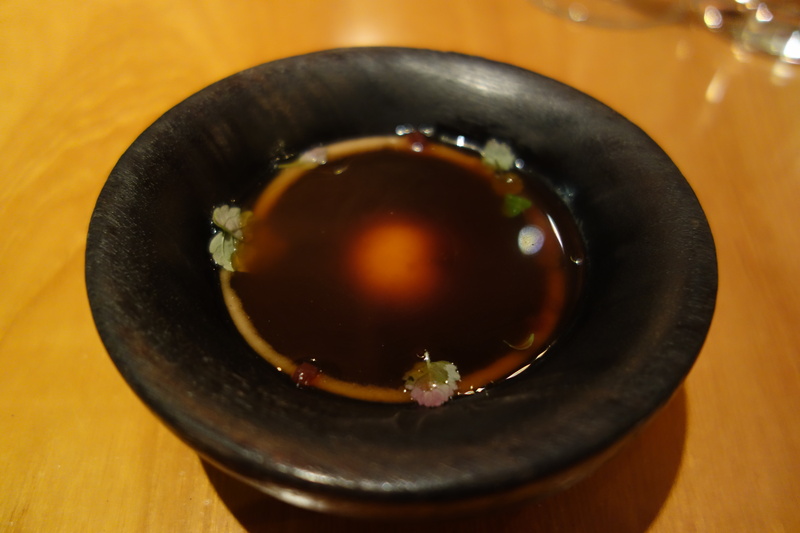 Complex broth. Salty squid noodles. 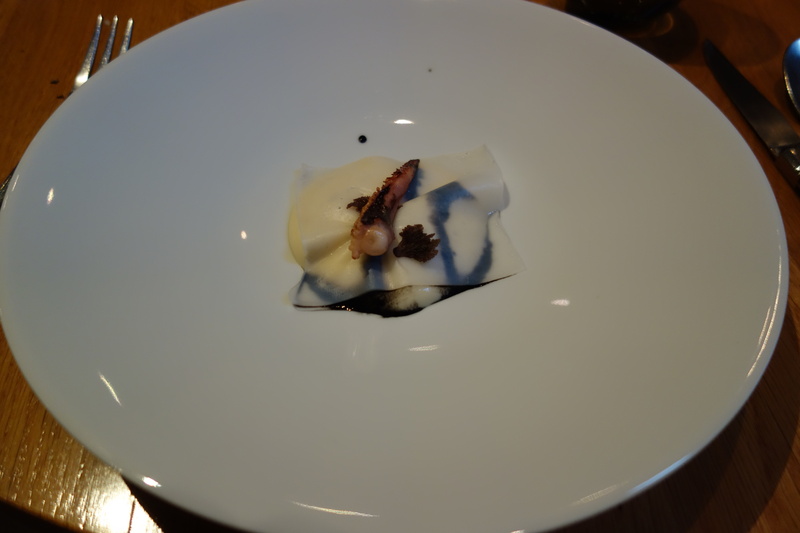 A complex bite, where the ham and truffles did most of the heavy lifting, with good squid texture approximating noodles. A surrealist ramen. 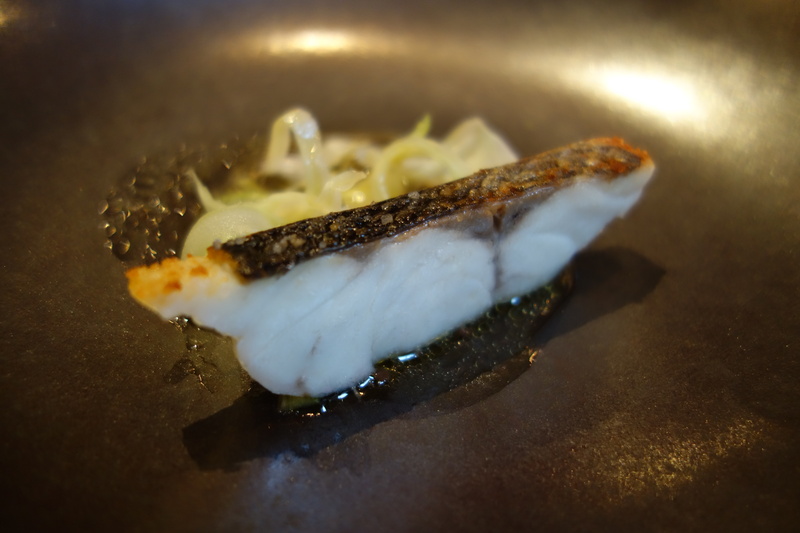 Shima-aji (White Trevally/Striped Horsemackerel). Turnip tempura, coconut, cilantro, thai chilli, cucumber. Good fish, fatty in texture like ham, but turnip tempura was a bit oily. Interesting choice of ingredients. – Japan and Thailand. Chef Crenn’s take on French onion soup. 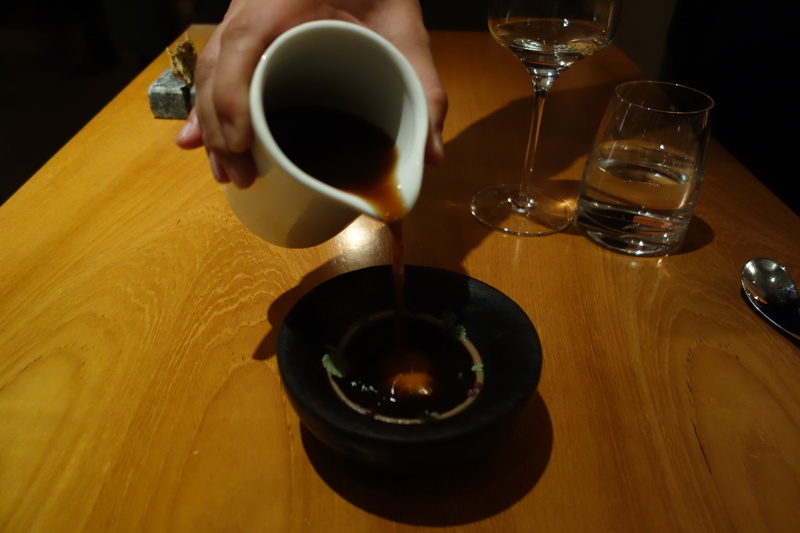 Broth of roasted charred onion. 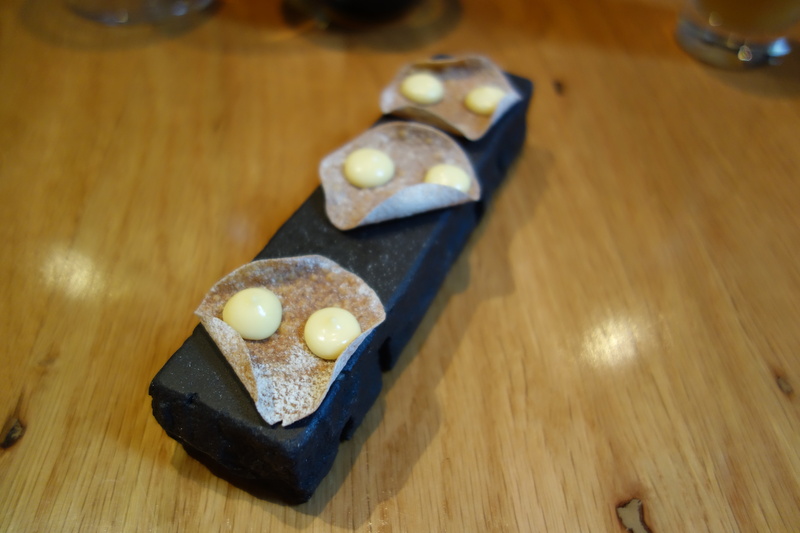 Dumpling comte + black truffle, shiso, lemon balm. 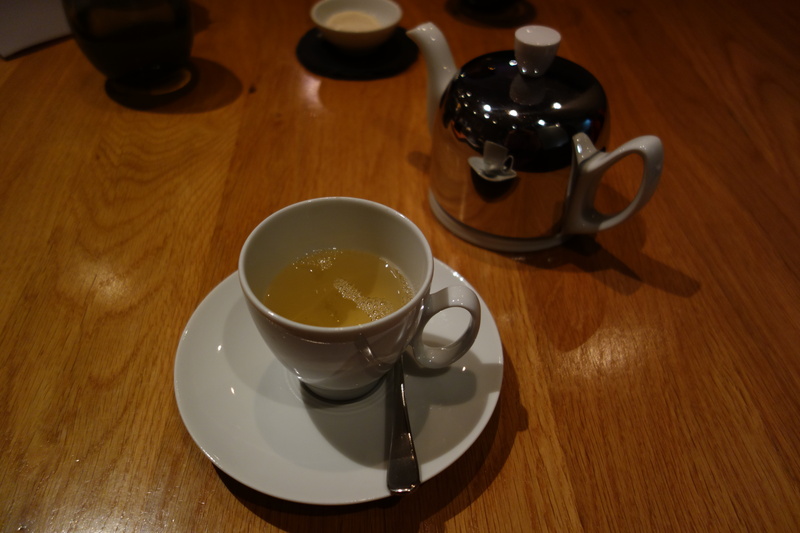 Apple vinegar jelly. 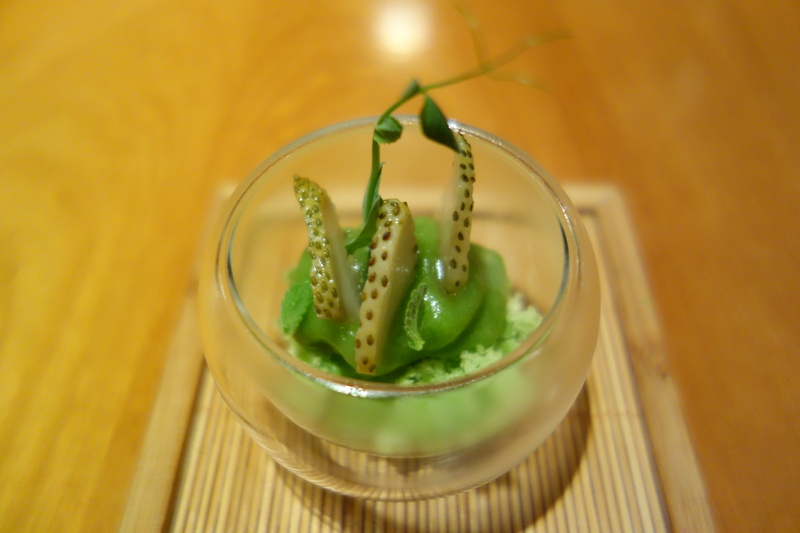 Shiso + green pea sorbet, pickled green strawberry. 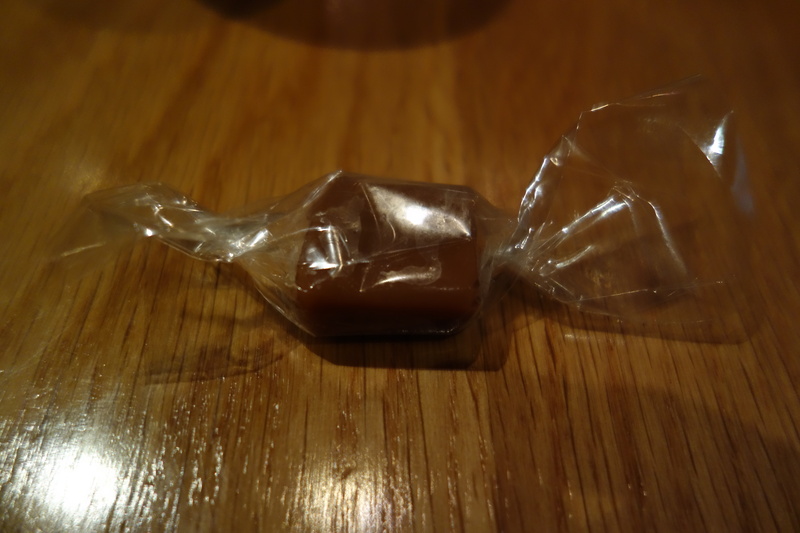 Rice wine vinegar ice. 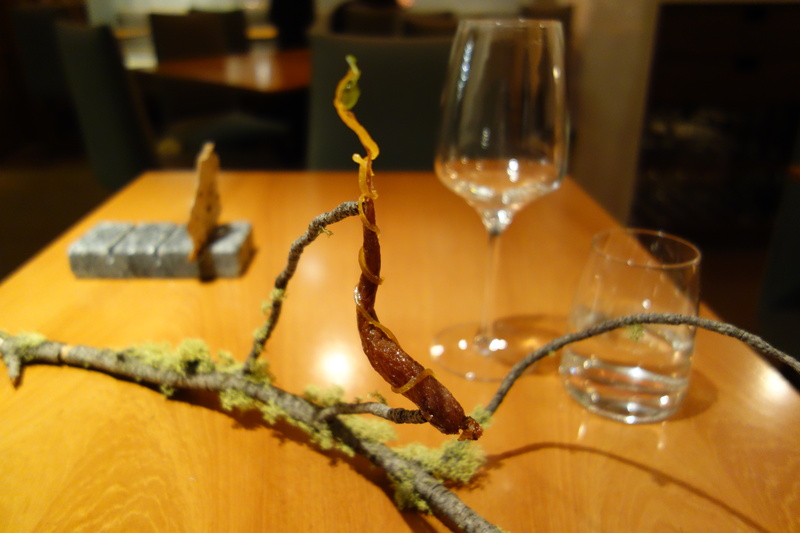 Carrot jerky from branches (a bit of a trope, see my meal at Borago, and Ruth Reichl’s report of her 2014 meal at Alinea LINK). 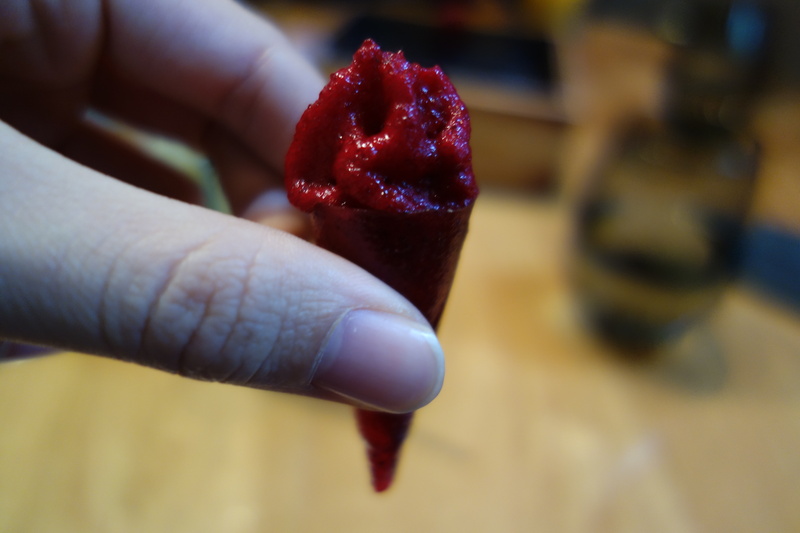 Carrot had a really intense candy flavor, salted, and with the right dash of cayenne pepper. A delight. 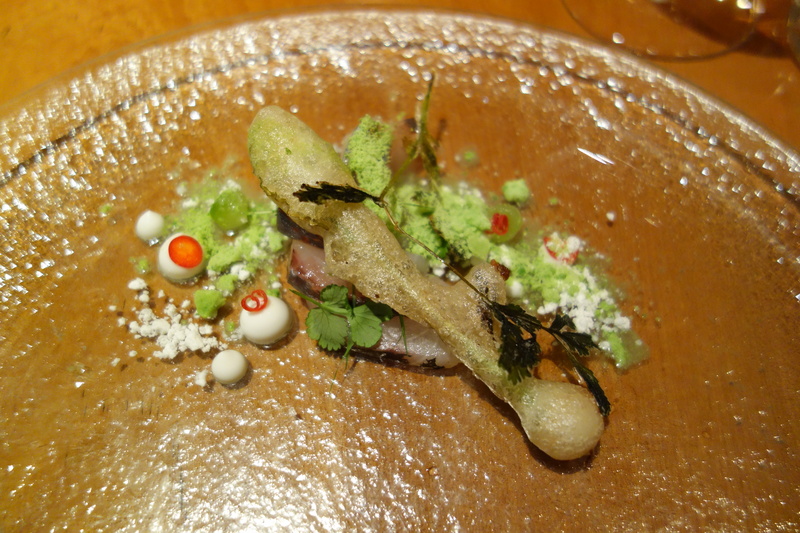 Surely the most complex dish of the night. I could not really draw out a “childhood memory” from this dish, but it was good. 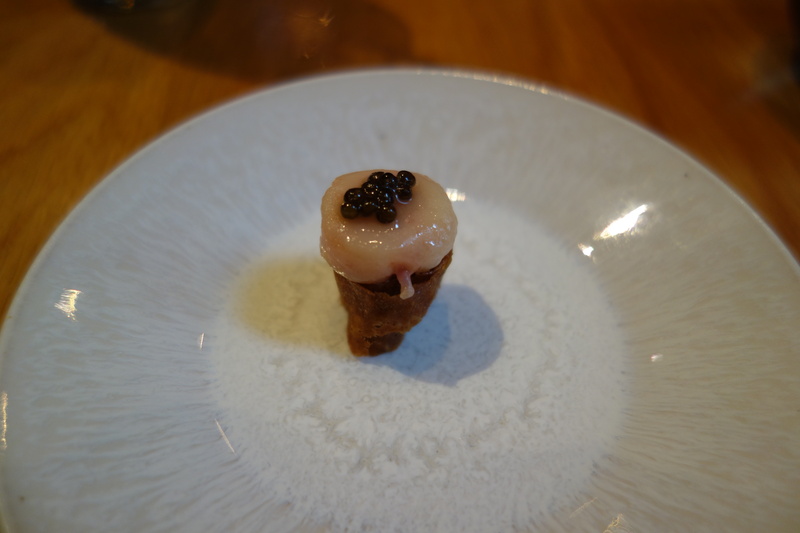 I was not sure what the smoked sturgeon pearls added to the dish though. Grade A1 wagyu cured. 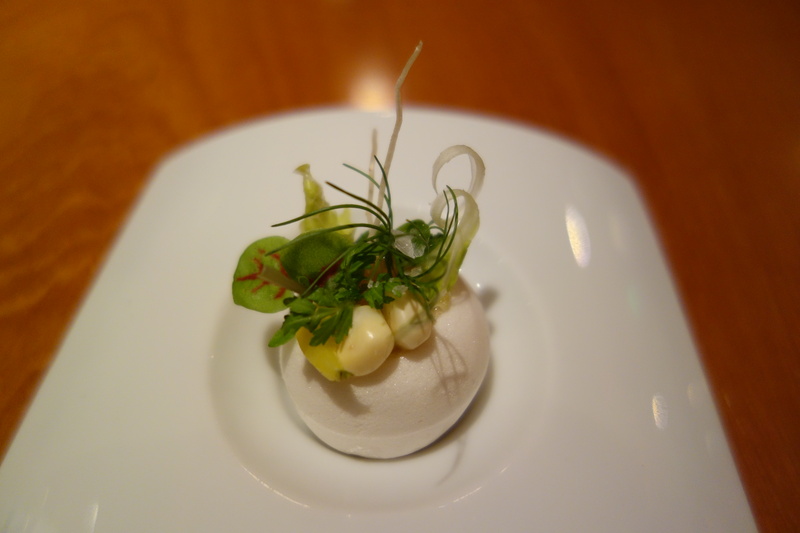 Apple puree, onion gelee. 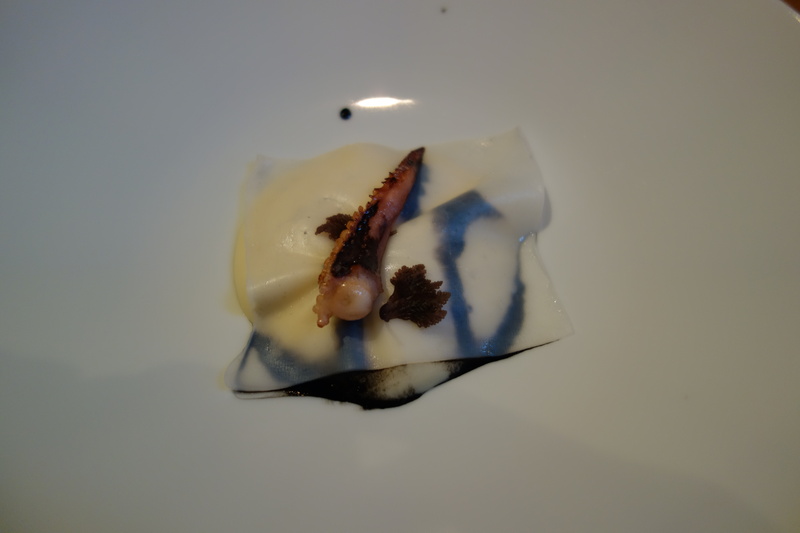 Soil of rye + squid ink. 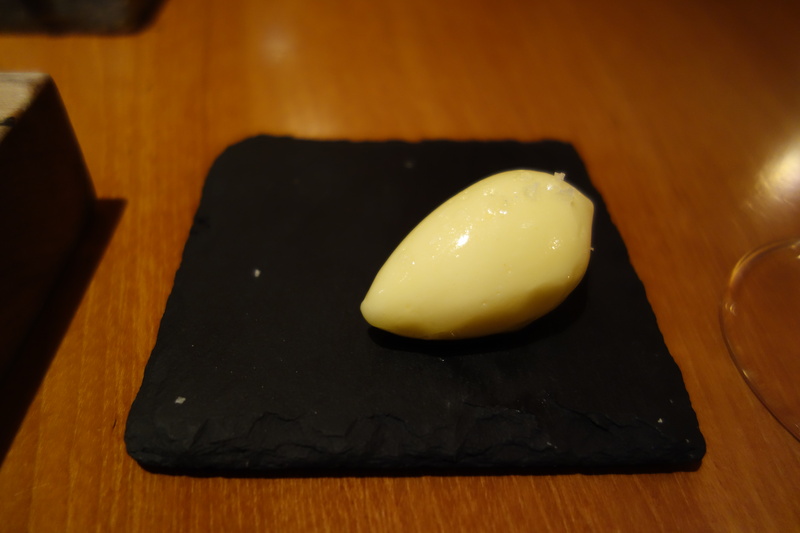 Horseradish puree. 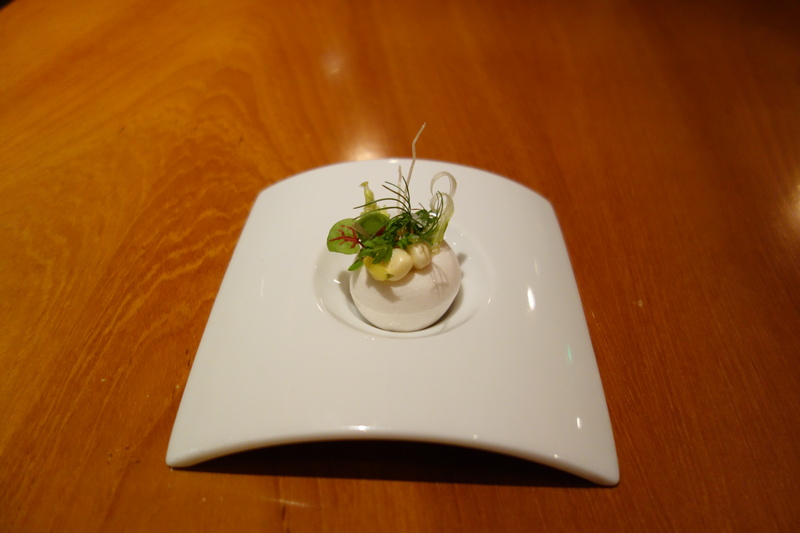 Onion gelee. Another successful dish. 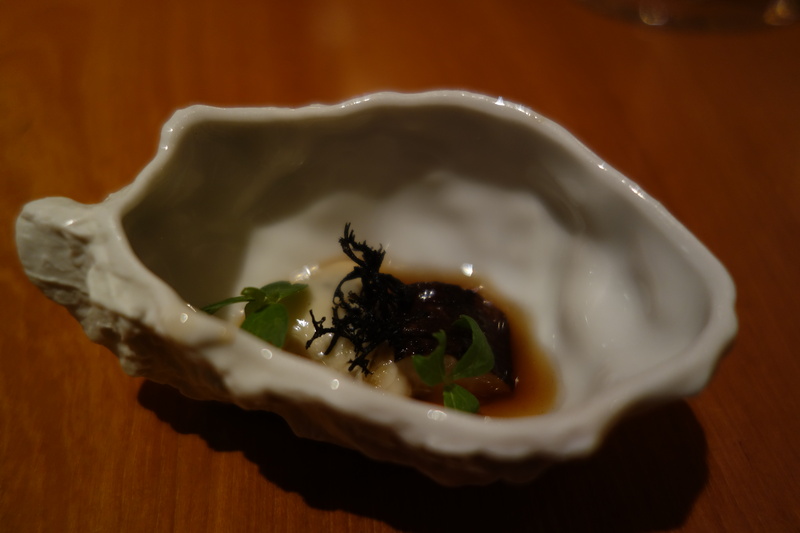 While at first glance one might decry the use of A1 wagyu in this dish (as opposed to a higher grade), this gave it a firm, striated consistency, and it is difficulty to see how it would have worked with oilier grades of wagyu. Hammy. Lobster bisque, phytoplankton dumpling, bone marrow, sea grapes, pickled onions, dashi gelee covering the lobster bisque, gelee of lobster brain. 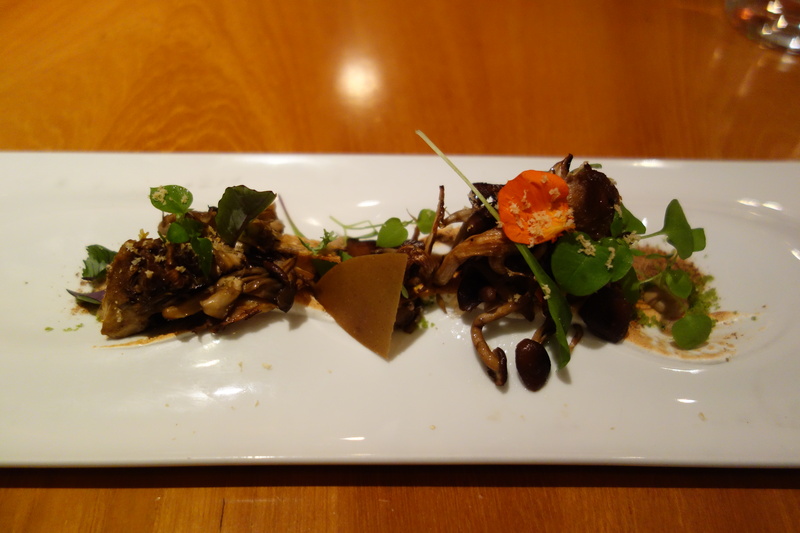 The pine, hazelnut and hen of woods (AKA maitake) (lightly roasted) gave an earthy smell to the dish. 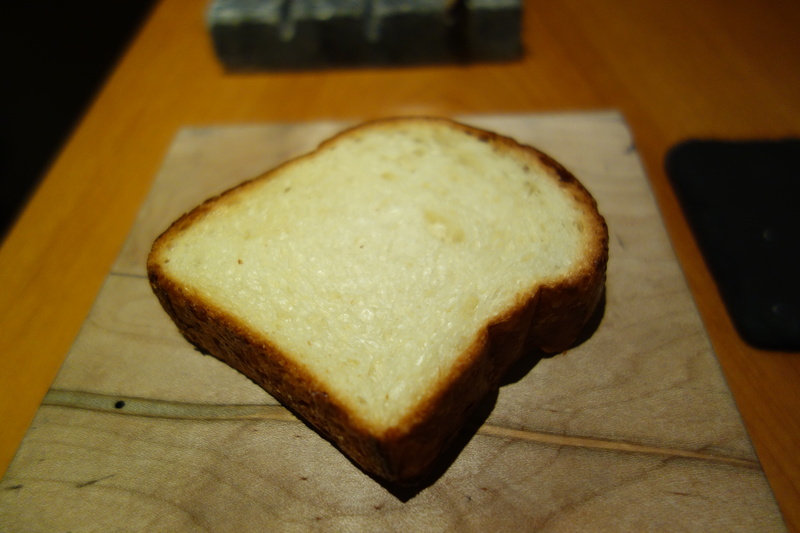 However the taste was too one dimensional (salt predominating) and it was also very dry. 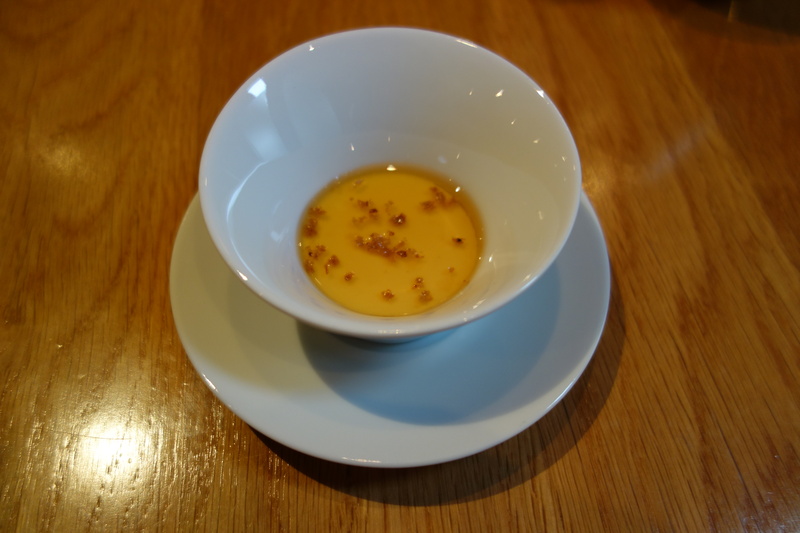 Duck consomme, meant to be drunk with a chocolate branch, duck and corn eggs, nested corn silk. wild rice, pear, apple, vanilla puree. 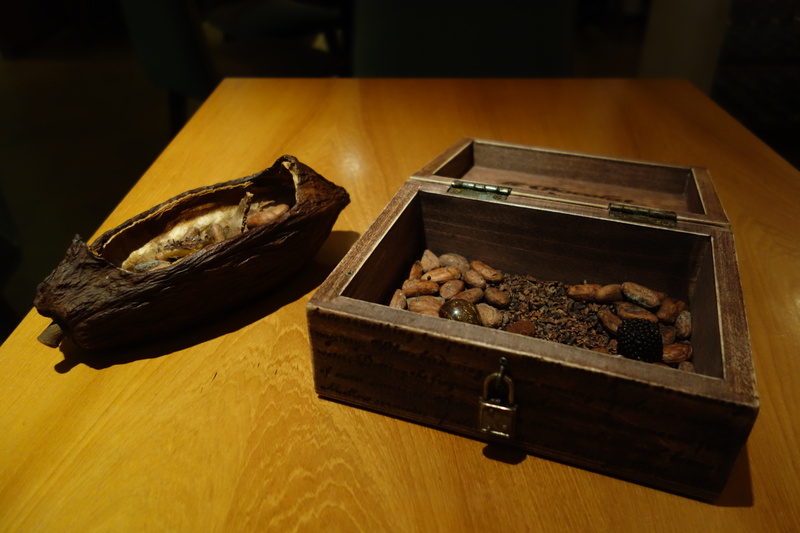 “Birth” – another conceptual dish which leaves me with no doubt that Chef Crenn is an artist’s chef. 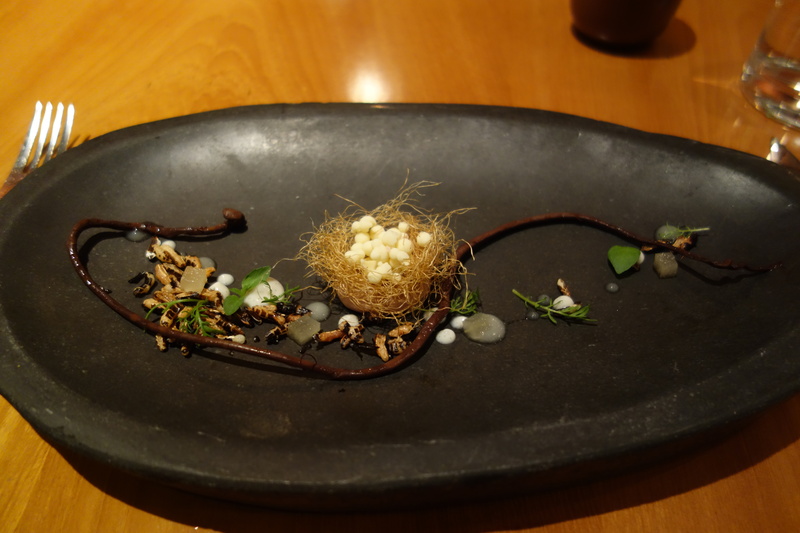 One might draw the comparison to a surrealist Dali painting of Birth – the surreal imagery of a nest on a highly fluid and stylised branch; and the taste of chocolate and duck consomme, which is a surreal pairing, reinforces this impression. 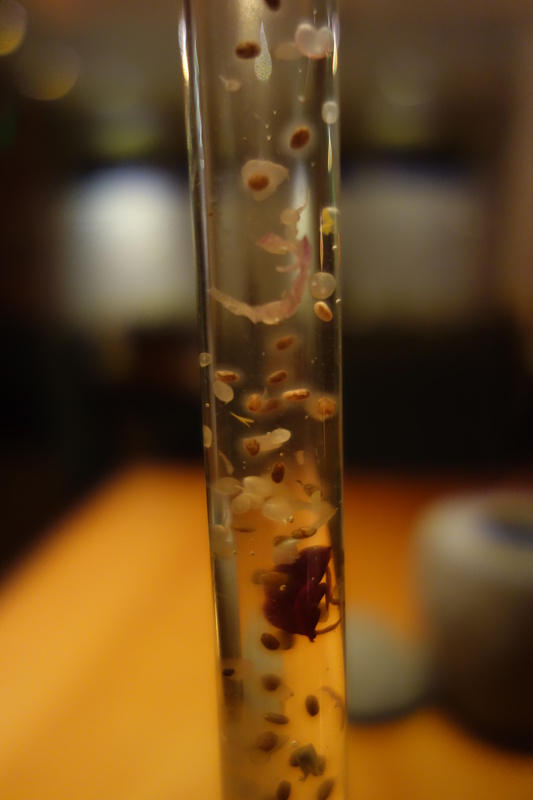 It was impressive to look at, and good in conception. 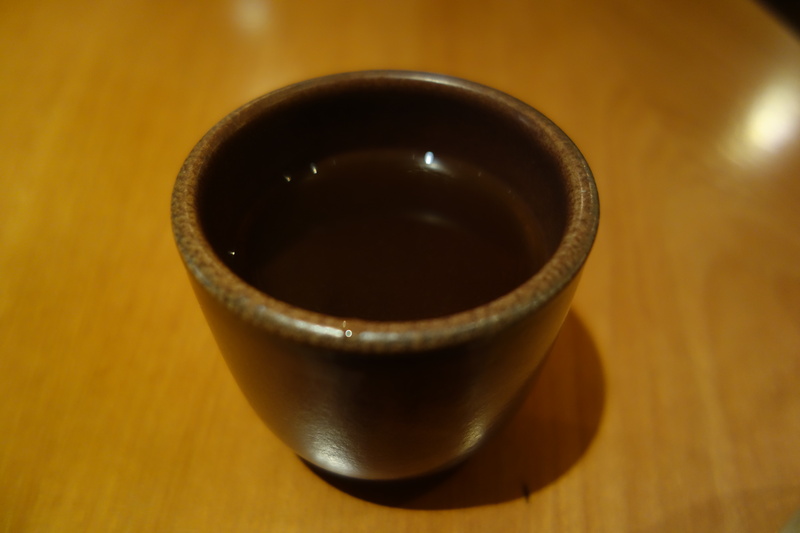 However it is not purely delicious, rather contrasting in flavor. 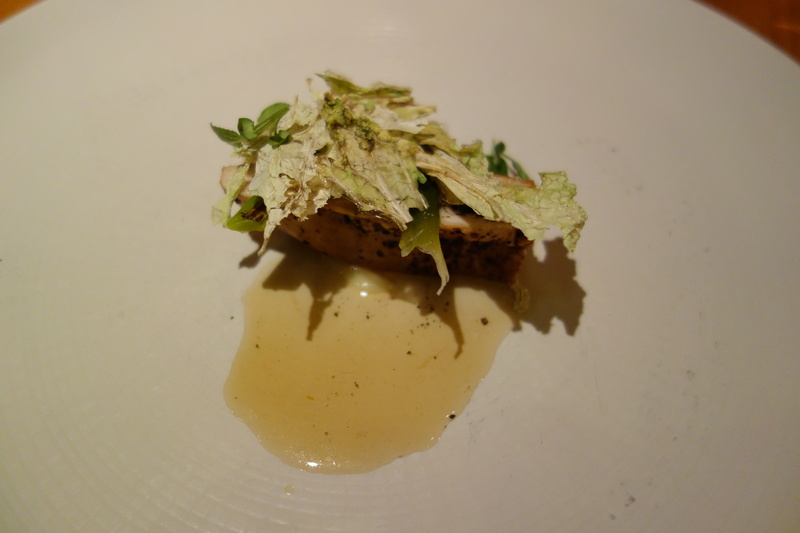 Guinea fowl, pintade, with nori seaweed butter, and lemon, preserved cabbage. The revaluation of ingredient values is on. 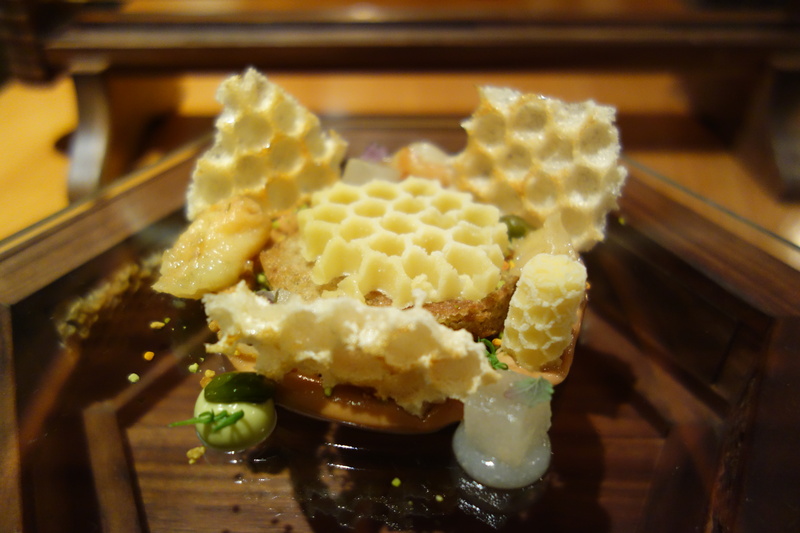 Chamomile-honey cake; Beeswax sorbet; white choc cremeux; pistachio/pear; honey meringue. Wax mold using bubble wrap. 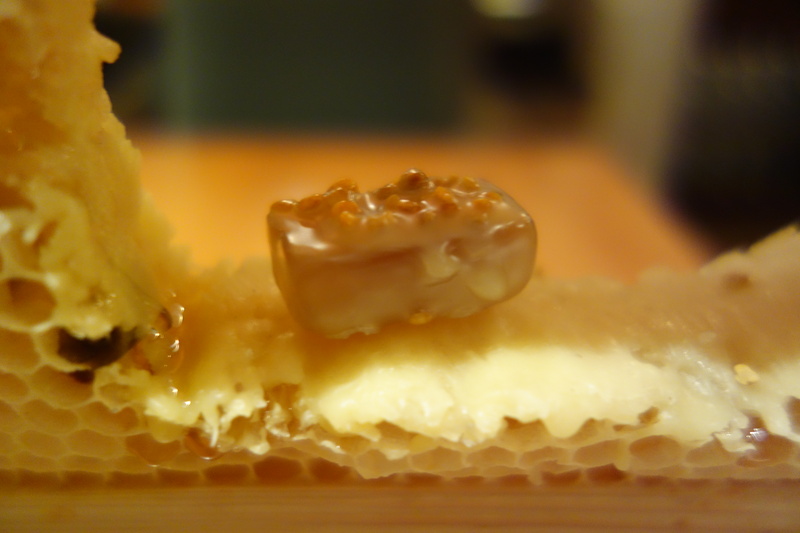 Caramel of beeswax and bees pollen. 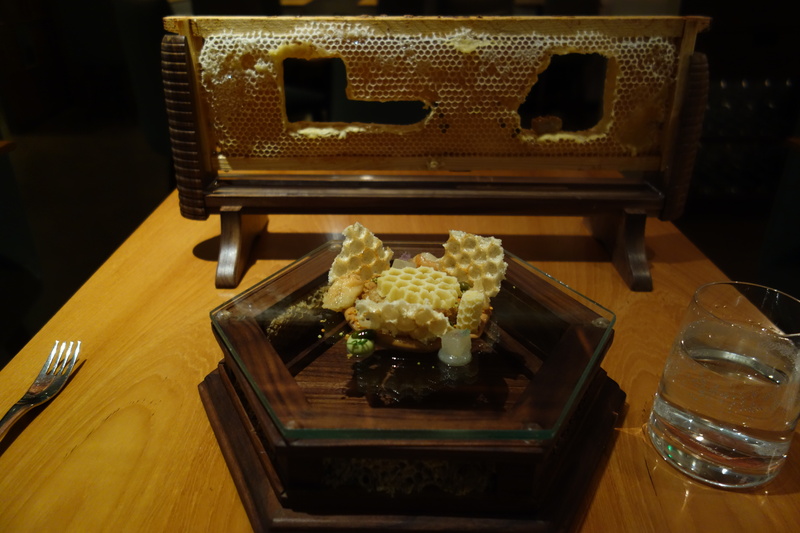 Full marks for imagination, a tour-de-force of the bee, but the use of pollen in the beeswax sorbet did irritate my palate a bit. poached very well, though largely tasteless. 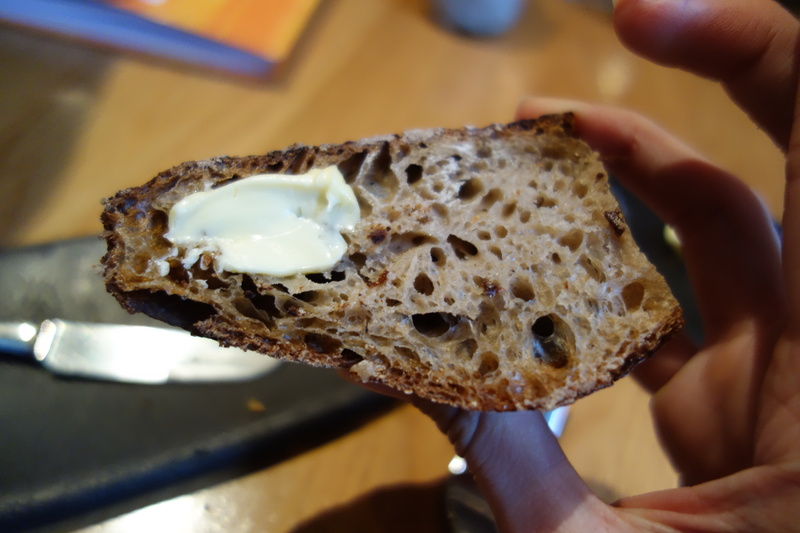 I was looking forward to trying this bread, learnt from French master baker Alex Croquet. It did not disappoint. 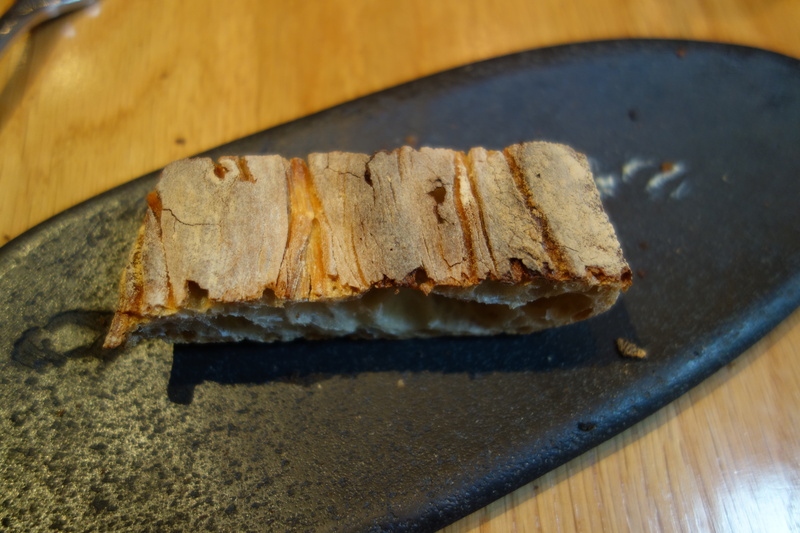 With a marvellously irregular crust and complex toasty flavors, I was very impressed with the bread. 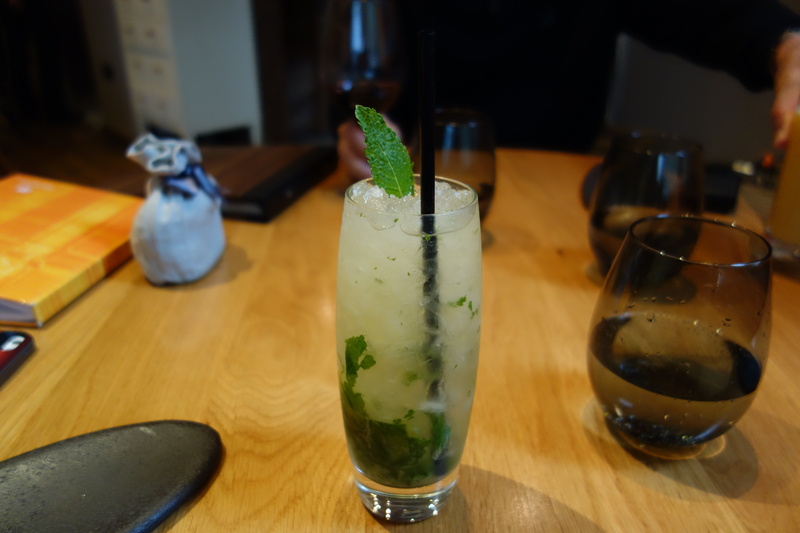 Well accompanied with mint, lime, cucumber flavors. This was a hallmark let-ingredients-speak-for-themselves dish. Sweet and juicy asparagus spears. 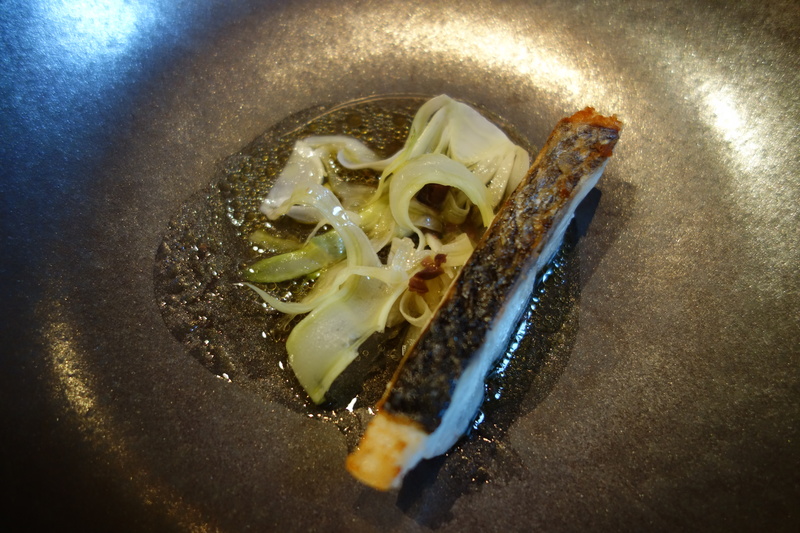 Really nice pan-fried sea bass, though the accompaniments (black olive esp.) were a bit puzzling. 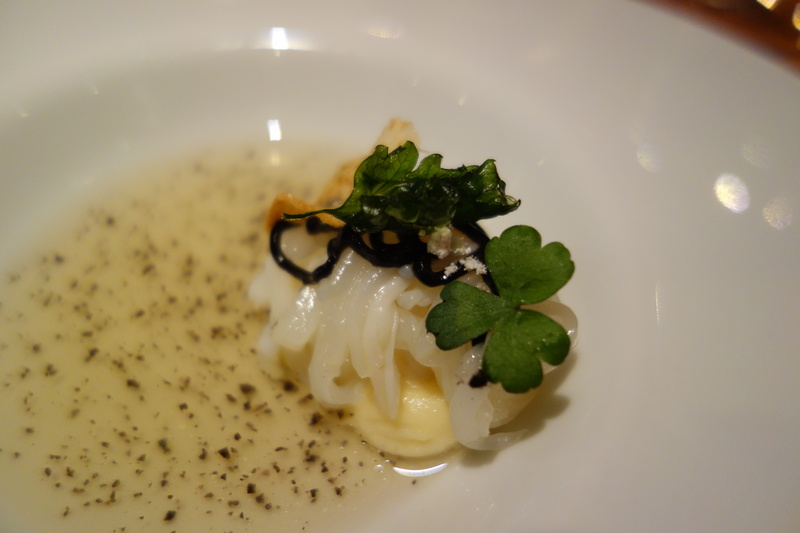 Not bad in taste, though the sheet of thin cuttlefish was nigh un-cuttable with my knife. I spent maybe 10 seconds sawing through that piece. 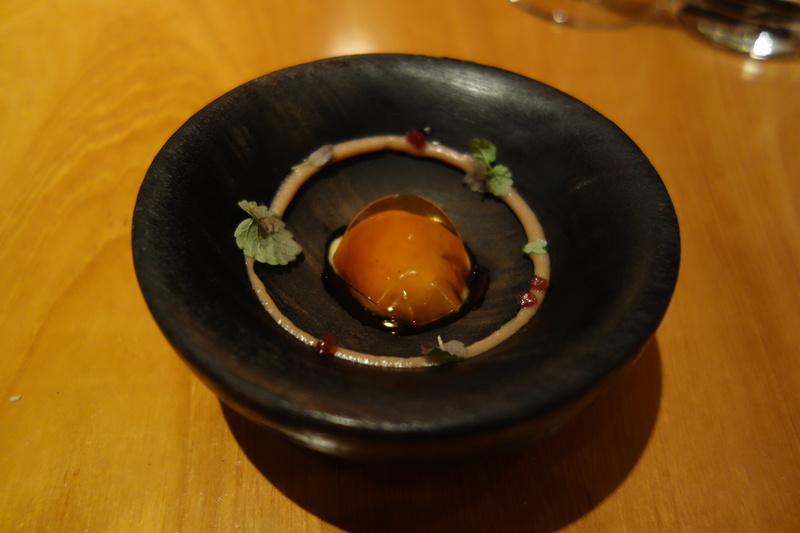 it was less accomplished than a smooth quail egg Ravioli I had at Schwa (Chicago) in March. 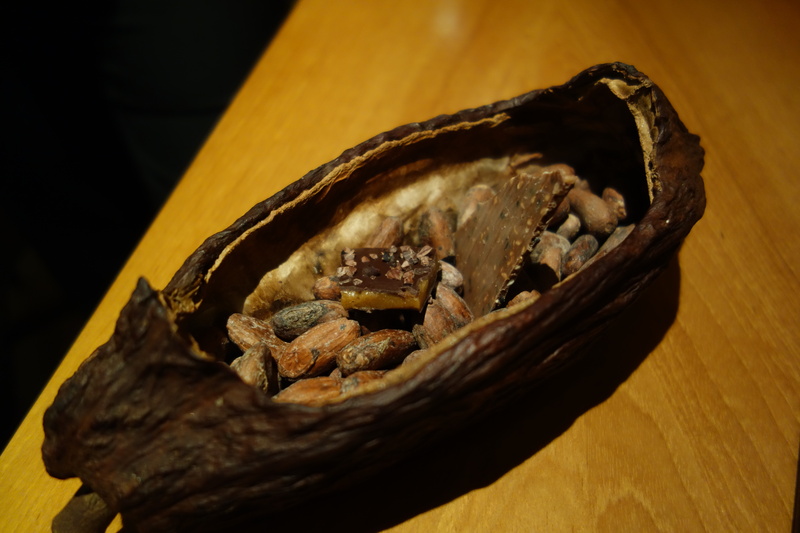 very good crisp skin, garden pea was in two forms, pureed and regular. morels with smoked paprika and lime juice. A disappointing let down at the crescendo. A cut of lamb whose tendon-ous texture I would not have minded one bit if it had profound flavor, was mostly flavorless and bland except on the outside. 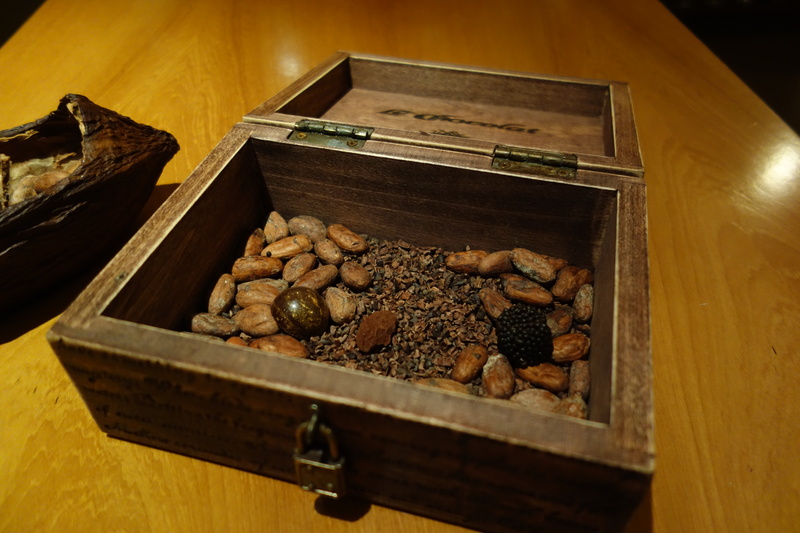 Hedone has first class desserts. 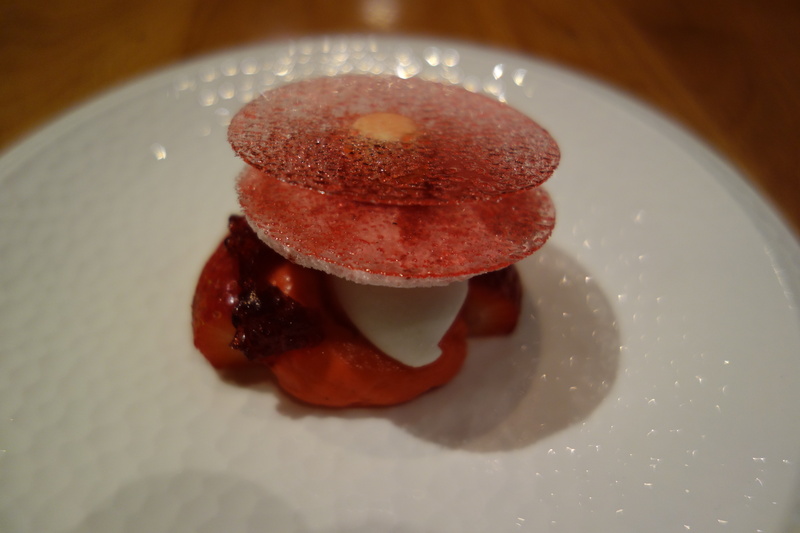 Here two discs of Hibiscus gelatin with coconut sorbet and dried strawberry meringue. 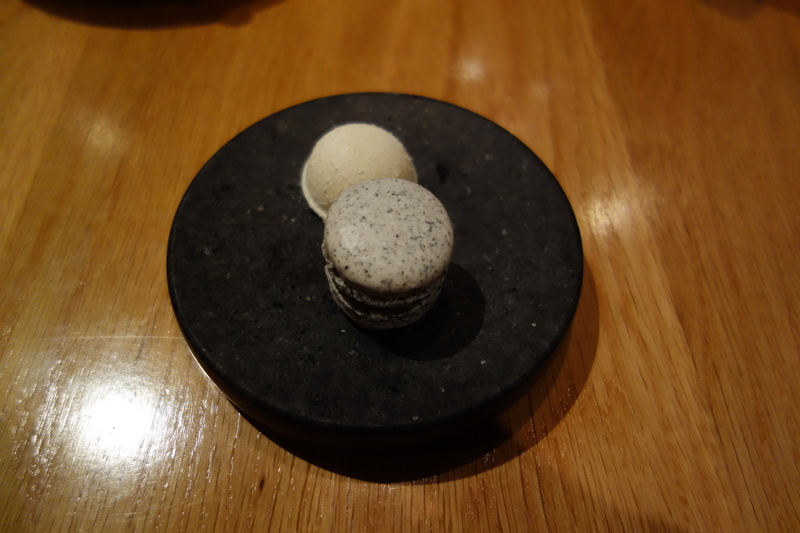 The Gariguettes were sweet enough to not die of comparative tartness in a contrasting mouthful with the sweet meringue and coconut sorbet. 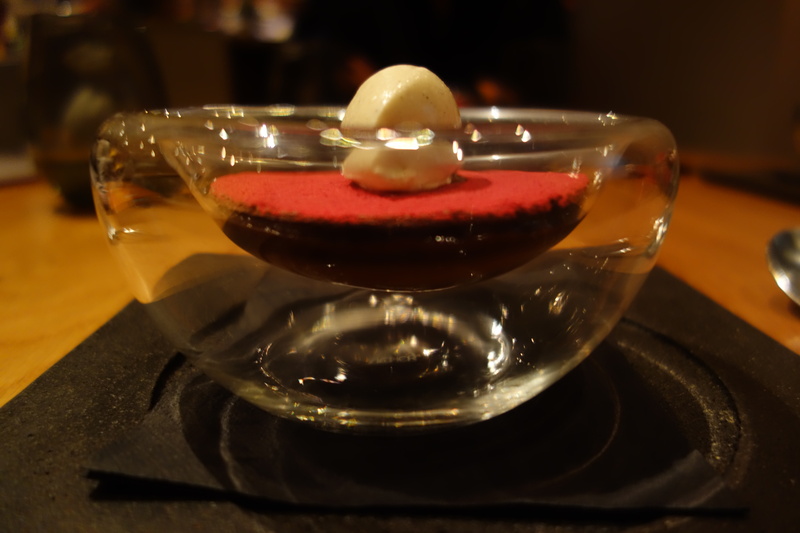 Warm chocolate fondant below a chocolate disc with raspberry powder, and vanilla ice cream on top. Classic and enjoyable.